Memphis is located in in the southwestern corner of the state of Tennessee close to the border of Arkansas and Mississippi. It is the second largest city in Tennessee and one the youngest of the major cities in state. The city was founded in 1819 by a group of wealthy Americans such as judge John Overton and future president Andrew Jackson. Memphis was named after an ancient Egyptian city on the Nile River. The city was officially incorporated in 1826 and was the temporary home of many river workers and people who were on their way to the West. In the 1840s the city began to boom due to the success in the cotton industry as cotton was farmed nearby. By 1850 Memphis had the largest inland cotton market in the world but relied a lot on slavery. This and the location would prove to be an unstable foundation in the future to come. Memphis held a pivotal role in the Civil War as recruits from the city formed more than 70 Confederate companies in 1861. A year later Memphis was lost to the Union after the Battle of Memphis which was a 90 minute fight between Confederate gunboats and Union Naval forces. The Union victory and the subsequent occupation as a hospital post for more than 5,000 Union soldiers was beneficiary for the city as it wasn’t terrorised at the end of the war. Furthermore merchants quickly realised that Union money was worth more than Confederate money which all led to a more easy recuperation. Even though the location of the city on the Mississippi River contributed to its success it was also the reason for one of its major disasters. The city didn’t have sanitary conditions and since it was exposed to flooding, it would create the perfect environment for mosquitos to breed. From 1873 during the yellow fever epidemic and the next five years, nearly the whole city was wiped out. People left the city and it was forced into bankruptcy. By the end of the 19th century, the leaders of Memphis decided to restore the city with the creation of a new sewer system and the establishment of clean drinking water for its citizens. Like other cities around the country, Memphis was hit hard by the Great Depression through the 1930s. As the country joined Word War II it provided a boost in commerce and industry thanks to the cotton market and several defence-related industries in the city. One of the biggest symbols of the war was created in the city which was the Memphis Belle, the first B-17 bomber to complete 25 missions successfully over Europe. The plane flew more than 32,000 km (20,000 miles) in combat without one single casualty. Memphis is one of the most amazing cities to visit if you are a fan of great music and the history of some of the greatest music ever created. The city is known as being the birthplace of rock and roll but many other musical styles that came before and after such as blues, gospel, soul and country. Some of the musical genres are hybrids of what came before as well. 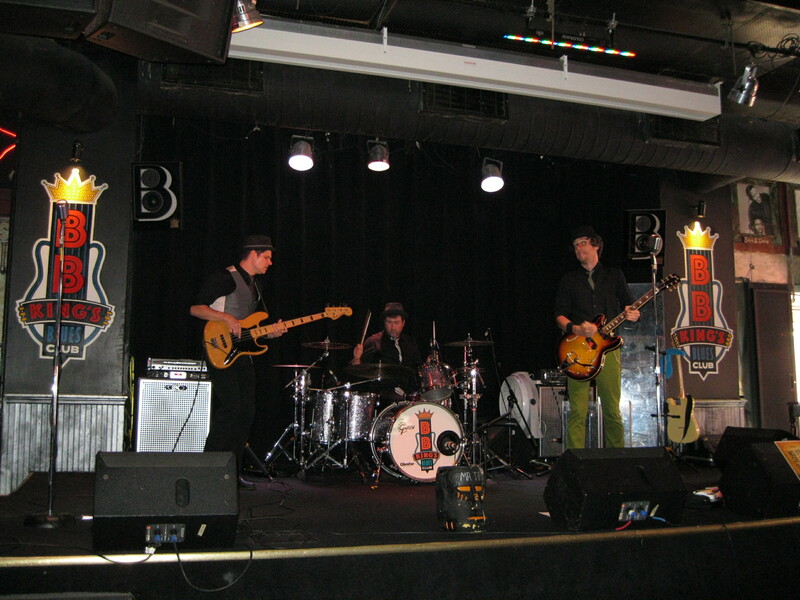 Some of the biggest music shrines are located in Memphis such as Sun Studio and Graceland and many other legendary places related to the birth of rock’n’roll and blues. When strolling around the Downtown area you will notice the huge music influence all the way through and the massive impact Elvis Presley has had on the city with posters hanging on walls with his image, Elvis souvenirs in shops and Elvis impersonators hanging around town just casually shopping as well. People just carry on as this is just a part of daily life. Only in America. So awesome. Composer William Christopher Handy was hired to write a campaign song for Mayor E.H. Crump in 1912 entitled the “Memphis Blues”. This was the first blues song ever published in the United States. Handy is therefore known as the Father of the Blues. The locals and workers from the cotton fields would go to Beale Street on the weekend for a good time and good music at the many music clubs. The workers would bring chanting songs known as “field hollers” and Handy was the first to record these songs and their “blue” notes. Simply the birth of the blues. 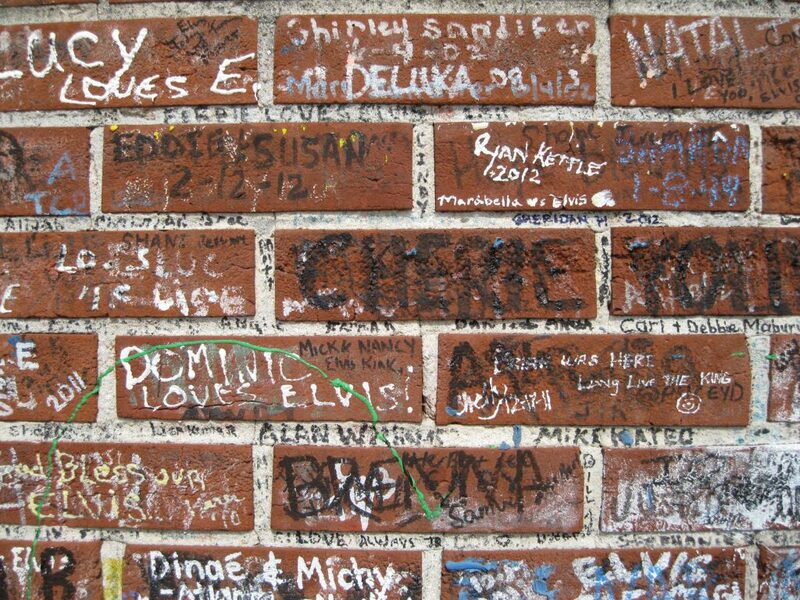 There is such an abundance of amazing music history associated with Memphis as it is the birthplace of rock’n’roll. Before this music style came to life in the early and mid-50s, there were blues, country, gospel and soul as well which all laid the foundation for the music to come. Sun Studio was a pivotal factor in the creation of rock’n’roll where a lot of the innovators of the genre recorded and so was Beale Street with all the artist performing at the music clubs. Beale Street, originally called Beale Avenue, was created by entrepreneur and developer Robertson Topp in 1841 who named it after a forgotten military hero. Initially the western part mostly consisted of shops and merchants trading goods with the ships along the Mississippi River. The eastern section was a wealthy suburb. After the yellow fever outbreaks of the 1870s, businessman Robert Church purchased the land around Beale Street. After the street underwent renovations in the 1890s, Church paid the city to create Church Park in 1899 on the corner of 4th Street and Beale Street, which became a recreational and cultural centre where blues musicians would gather. In the early 1900s nightclubs, theatres, restaurants and music venues started appearing on Beale Street and during it’s heyday in the 1920s gambling, prostitution and even murder had a presence in the area as well. By the 1960 Beale Street went through a challenging period with a lot of businesses closed. The section from Main to 4th Street was declared a National Historic Landmark on 23 May 1966 and on 15 December 1977 Beale Street was declared “The Home of the Blues” by Congress. Still, it was literally a ghost town at this point though due to a failed urban renewal plan. In 1973, the Beale Street Development Corporation was formed as a cooperative effort to redevelop Beale Street. 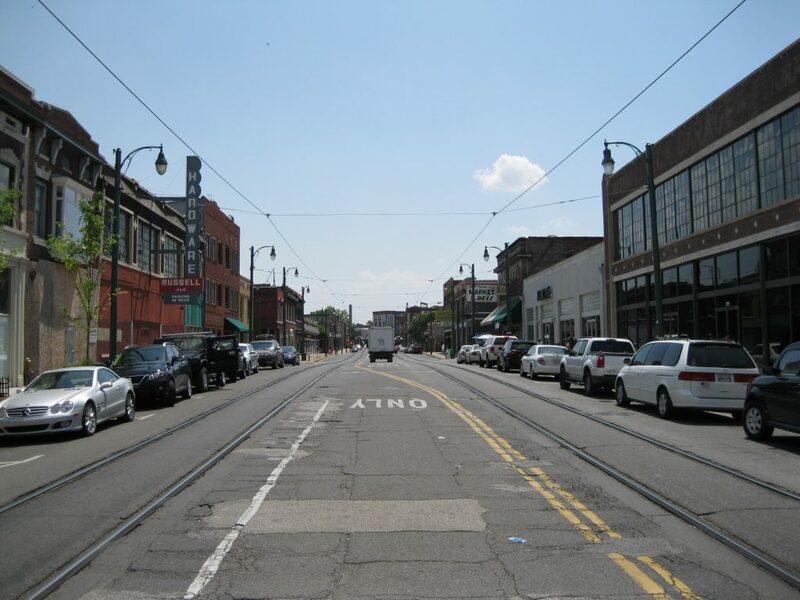 They were selected by the City of Memphis in August 1978 to renovate the sections between 2nd and 4th Street with grant of 5.2 million USD to preserve its history and cultural impact. The daily management of Beale Street was turned over to the City of Memphis in 2012. Beale Street is most exciting part of town. This is where all the entertainment is based. 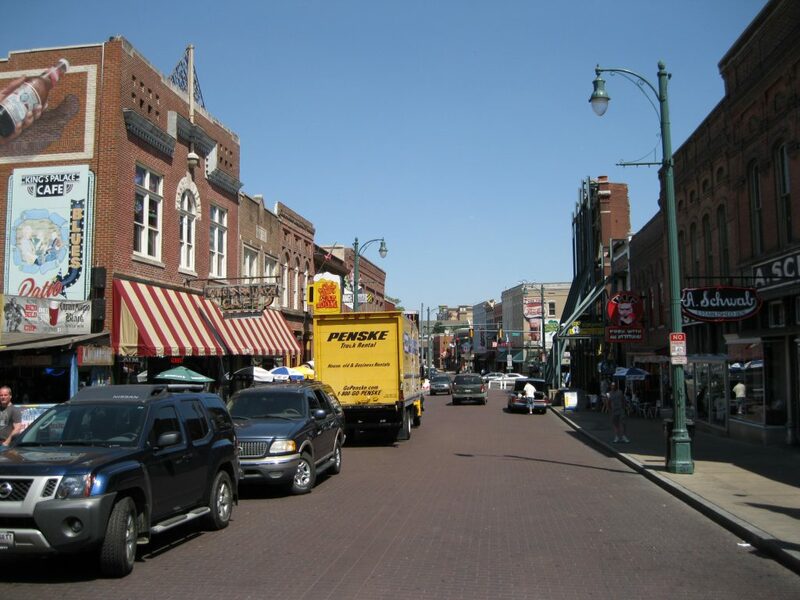 Bear in mind it is a very long street of about 2.9 km (1.8 miles) and it is only in the part of Beale Street towards Downtown, between Main and 4th Street mostly around 2nd Street, where all the cool venues are located and you will be set for a happening time out on the town. The street is significant due to its vital impact on the history of the blues and rock’n’roll. There are several magnificent music venues such as BB King’s Blues Club and several other restaurants where you can get some very good southern cooking such as ribs, Gumbo or Jambalaya. Amazing stuff. 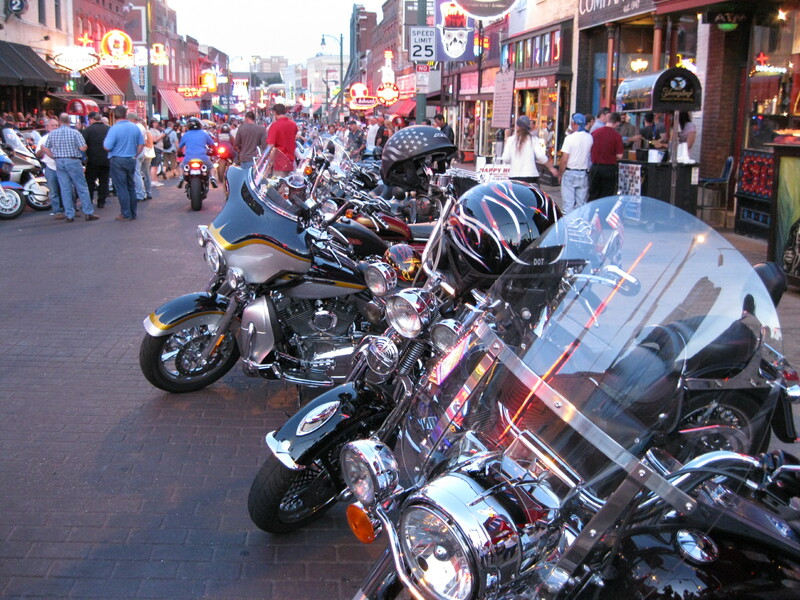 Taking a stroll down Beale Street is one of the highlights when visiting Memphis. Imagining what life would have been like in the heyday. The atmosphere on Beale Street at night is fantastic with a fair bit of outside entertainment. You will see kids doing cartwheels up the street and street performers playing some great blues and rock’n’roll. A walk down Beale Street during the day is glorious as well. Some of the bars and venues have entertainment early on, so the street has quite a great atmosphere in the daytime as well. On the corner of 2nd Street and Beale Street, right at the entrance to the part of Beale Street where all the entertainment is, BB King’s Blues Club is located at 143 Beale Street. This is a concert venue, a restaurant and is one of the highlights in town. 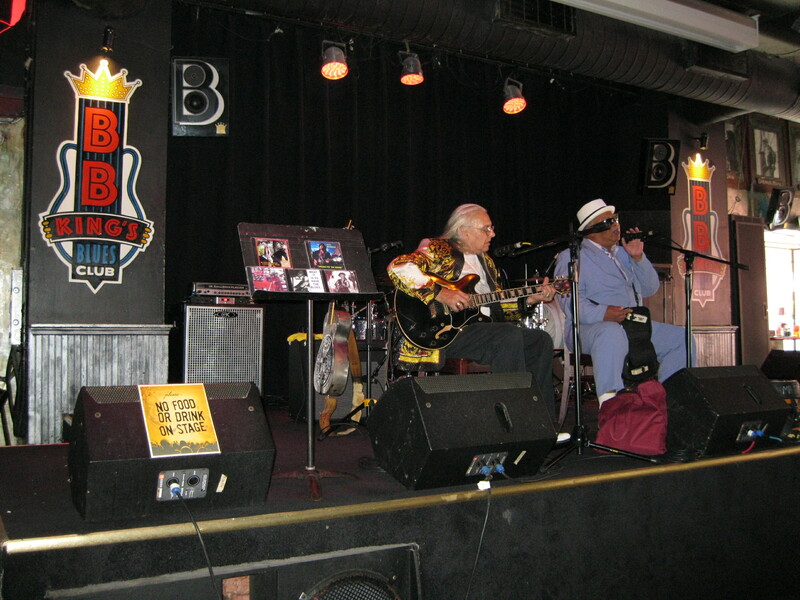 If you have been strolling around town for a bit in the scorching heat during the day, heading into BB King’s Blues Club for lunch is a great way to have a bit of a chill and a cool down. There is such a great buzz here with live music, great southern food on the menu and friendly people. The interior sets the stage for a laid back and cosy atmosphere being a combined bar and restaurant environment with striking art work on the tables with references to local music sights such as Sun Studio. The bands playing are very good and will most likely be local musicians playing blues, rock and soul as an appropriate tribute to Memphis. The level of musicianship seen in these bands is quite phenomenal and is a great supplement to your lunch. You could also just visit to watch a show and have a drink. Let the vibe of the wonderful sounds take you on a musical journey. 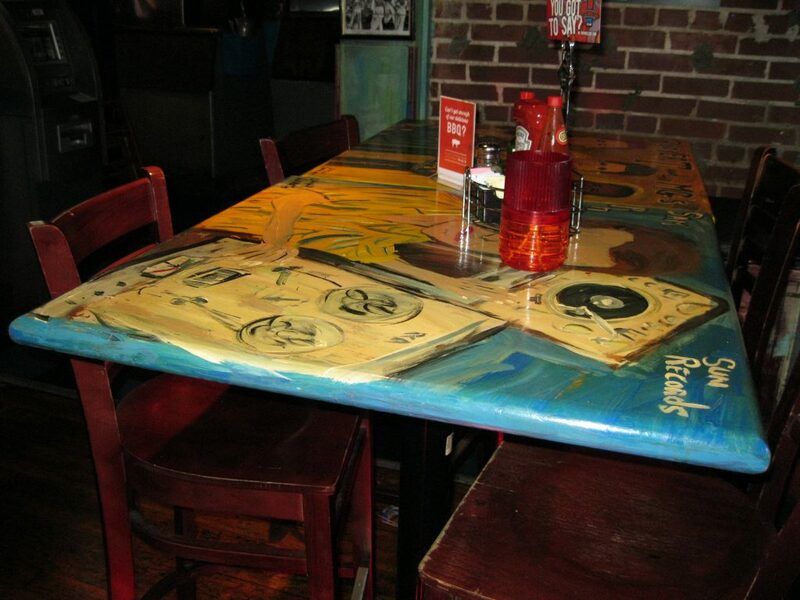 There are several nice restaurants on Beale Street where you can get some good local grub. You will find an abundance of barbeque food which is just how they roll in Memphis. There is no shortage on spiced up dishes either like the southern faves Gumbo and Jambalaya which are normally more associated with New Orleans but they certainly also know how to make these excellent creations in Memphis. Several of the eateries have a welcoming and laid back atmosphere and it such a joy after a long day exploring town to have a chill and just savour the food. As you make your way around town you will notice the very distinct Memphis accent. Even if you are native English speaker or are fluent in the language it can at times be quite hard to understand the accent and the massive southern drawl which is really charming and cool. The Memphians are nice and friendly people and will do there best to make themselves understandable. 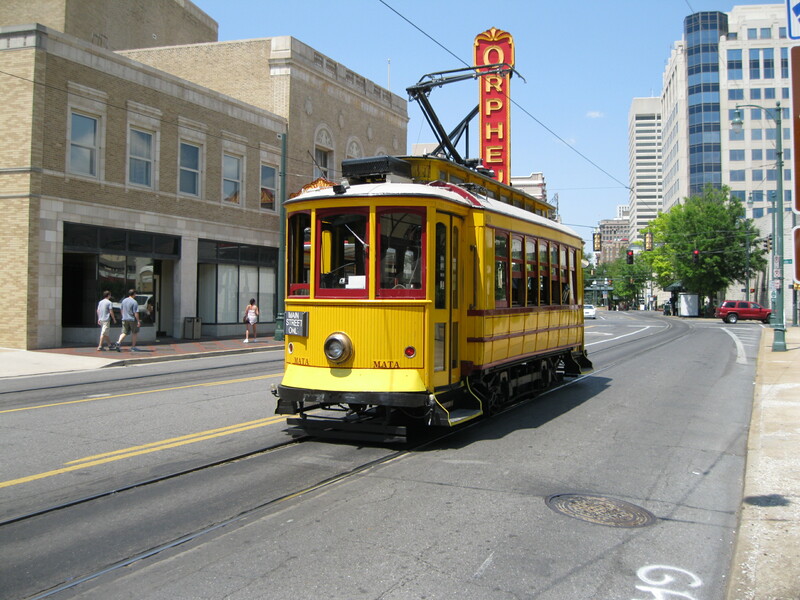 There are three trolley lines in town using heritage streetcars. The Main Street Line, the Riverfront Loop and the Madison Avenue Line. All lines travel through the Downtown area. This adds a cool character to the area along with the classic architecture as seen on Main Street. The trolley system consists of 24 stations. Connections between the trolley and busses can be made at the North End Terminal. The legendary Sun Studio is the very cradle of rock’n’roll where many of the first recordings of this magnificent style of music were created. For a fan of rock’n’roll and quality music in general, this is one of the most pivotal shrines in the world. You absolutely have to visit Sun Studio and take the tour of the establishment as well. Even if you’re not a music fan you should still do it as it’s a big part of the history of Memphis. 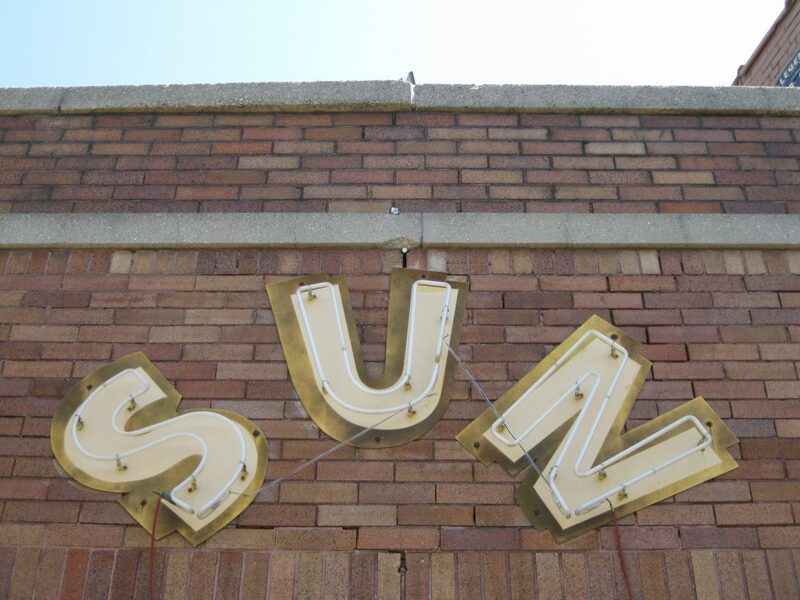 Sun Studio is located at 706 Union Avenue in a pretty modest neighbourhood. It’s not flashy at all which is very charming as it is not touristy. Sam Phillips opened the Memphis Recording Service, as Sun Studio was initially called, on 3 January 1950. He was also the founder of Sun Records, established in February 1952, which would share the same building. Sun Records gained the reputation of being a label that treated local artists respectfully. The environment created by Phillips was non-critical and spontaneous which resulted in a lot of creativity and vision. Many different styles of music were recorded such as gospel, blues, country and swing. During the first years of Sun Studio artists like B.B. King and Howlin’ Wolf would be among the most noticeable recording artists. Phillips failed to make the studio profitable at the time. Still, Phillips managed to keep the business afloat. The first rock’n’roll song ever recorded is believed to be “Rocket 88” in 1951. It was actually by Ike Turner’s Kings of Rhythm but was credited as Jackie Brenston and his Delta Cats. Brenston was Turner’s saxophone player. The song was produced by Sam Phillips and the composition was credited solely to Brenston even though it was co-written with Turner. The recording of “Rocket 88” was the first ever to use a distorted guitar which became one of the key elements in the rock’n’roll sound. The legend has it that guitarist Willie Kizart damaged his amplifier on Highway 61 as the band was driving from Mississippi to Memphis. To hold the cone in place inside the amplifier they stuffed it with newpapers which unintentionally created the distortion which Sam Phillips liked and kept for the recording. In a nutshell this was how rock’n’roll was created and a perfect example of how necessity leads to innovation. Many of the rock’n’roll pioneers were discovered by Sam Phillips and recorded at Sun Studio. The most noticeable was Elvis Presley whom without competition is the biggest singer of the 20th century and would rightfully be known as the King of Rock and Roll or simply The King. Elvis first paid Sun Studio a visit in august 1953 to record a demo. He wanted to know what his voice sounded like on record as he had ambitions about becoming a singer. Sam Phillips wasn’t in, so receptionist Marion Keisker greeted Elvis and handled the session. Elvis recorded “My Happiness” allegedly as a belated birthday present for his mother and “That’s When Your Heartaches Begin”. Nothing further happened until Elvis returned in January 1954 to make another demo where Sam Phillips started to pay attention to young man, but it wasn’t until the summer of 1954 where Phillips, at Marion Keisker’s suggestion, requested Elvis to come into the studio that they began to record material Phillips intended to release. Phillips was not too satisfied with the result, but was impressed enough to team Elvis up with local musicians Scotty Moore on guitar and Bill Black on bass to see what they could create together. Nothing interesting came about until the end of an exhausting session where Elvis started playing his version of the Arthur Crudup song “That’s All Right” and the magic happened. This became Elvis Presley’s first single and release and started one of the most glorious careers ever in music history. Elvis was a big part of creating the Sun Sound by infusing country with rhythm and blues. In effect he also paved the way for more ground-breaking talent to record at Sun Studio such as Johnny Cash, Jerry Lee Lewis and Carl Perkins who all four were known as the Million Dollar Quartet collectively. There is a recording of the foursome from 4 December 1956 which was a jam session. It wasn’t released until 1981 as the Million Dollar Quartet with a few more track added a few year later. This was a defining moment in rock’n’roll and music history. Luckily Sam Phillips decided to record this session as it was all improvised. The session happened all by coincidence. Carl Perkins was in the studio for a recording session where Jerry Lee Lewis participated on piano. Elvis Presley made a casual call at the studio with his girlfriend. He listened to the recording of Perkins’ session with Sam Phillips and liked it. Presley went into the studio to join Perkins and Lewis. Johnny Cash had popped by the studio as well, so he too joined the session and the Million Dollar Quartet was born. Sun Studio expanded a great deal during the mid-50s mainly due to the sales of Elvis Presley records. Phillips realised that Sun Studio was not big enough to break Elvis nationwide and he also still had financial issues. Phillips met with Colonel Tom Parker, a shrewd businessman, who convinced him, that Elvis needed a national record label to benefit his career. Phillips agreed to sell Elvis’ contract for a total of 35,000 USD which was a massive amount in the day. Elvis signed a record contract with RCA Victor in November 1955 and Phillips used the money to pay off debts and expand the careers of Johnny Cash, Carl Perkins, Jerry Lee Lewis and Roy Orbison. Upon entering Sun Studio you will find a souvenir shop where you can buy a ticket for the tour of Sun Studio. There is a lot of awesome Sun Studio merchandise that is just to die for, especially if you are a big music and rock’n’roll fan, you will feel like a kid in a candy store. Everything from caps and t-shirts to fridge magnets are available for purchase. 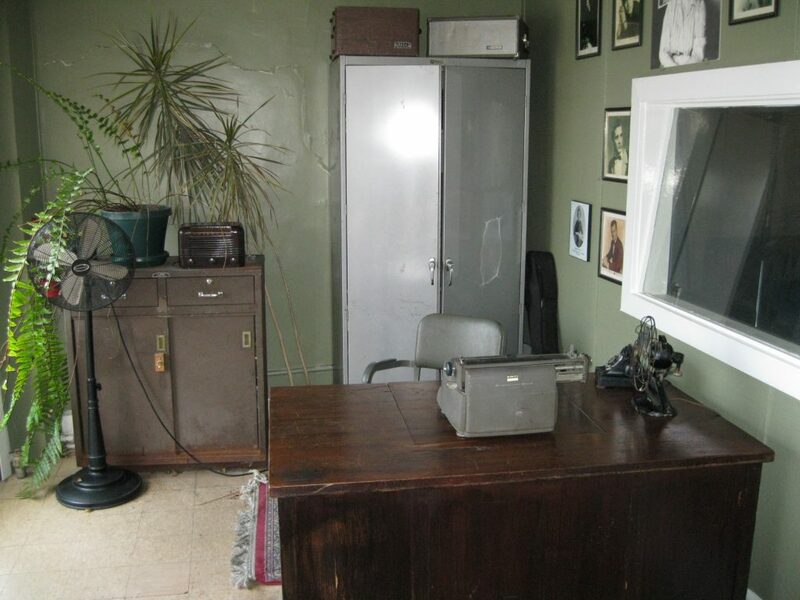 On the tour of the studio you will be guided through the facilities of this amazing and historical establishment. Some the equipment used for the recordings back in the 50s are on display for you to check out while the guide explains how the process worked at the time and shares many fascinating anecdotes. In between the narrative of the guide, excerpts of songs recorded at Sun Studio will be played, taking you back in history through the midst of time. It may just give you goose bumps. Very cool. Captivating stories will be shared about what is believed to be the very first rock’n’roll song ever recorded, as mentioned earlier, how the rock’n’roll song came about, the recordings of legends like Elvis Presley, Jerry Lee Lewis, Johnny Cash, Carl Perkins and Roy Orbison and the history of the building, the studio and producer Sam Phillips. The tales of Sun Studio are so fascinating and can make you a bit emotional if you love your rock’n’roll, so get ready for a bit of a moving tour. 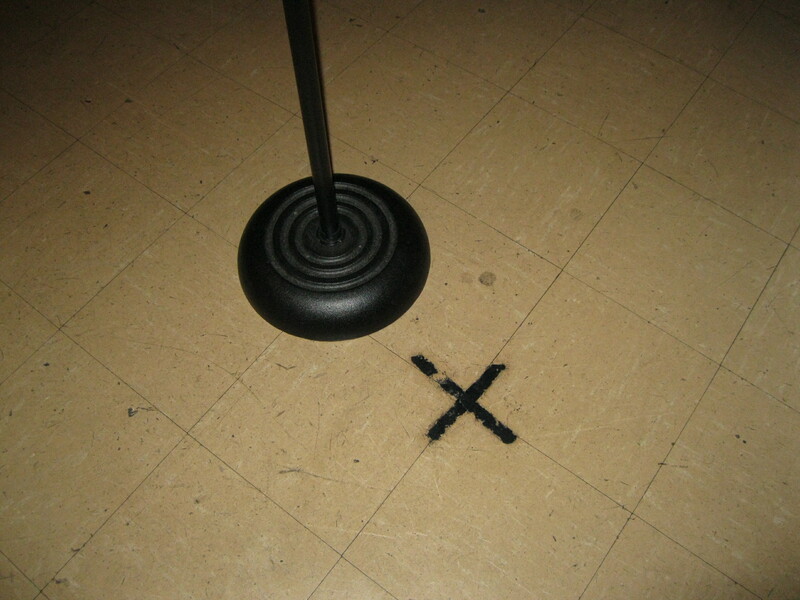 The spots where Elvis and his musicians played are marked on the ground along with some of the original equipment. 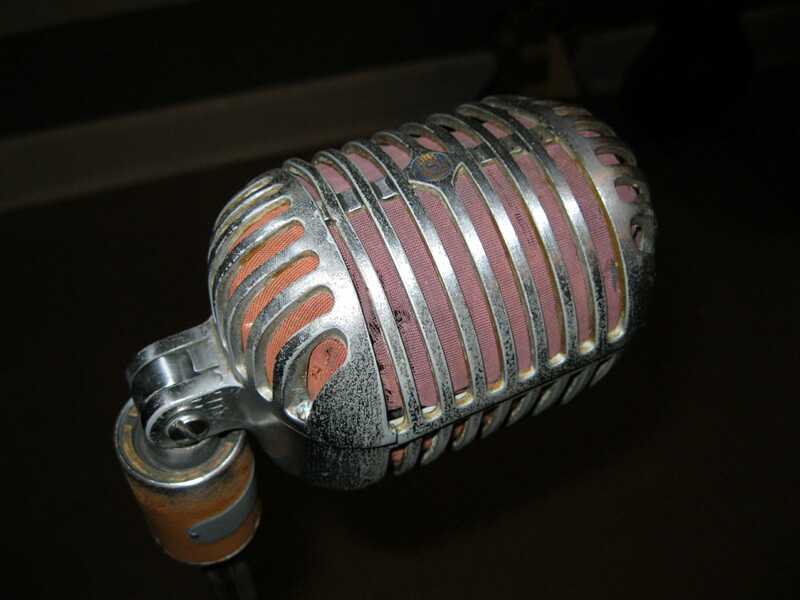 You can get a picture of yourself with the microphone Elvis used during his recordings. So get ready with your best curled lip pose. You also have the option of kissing the ground of the studio, if you are big enough of a fan. They assure you that the floor is cleaned every day. So go for it. 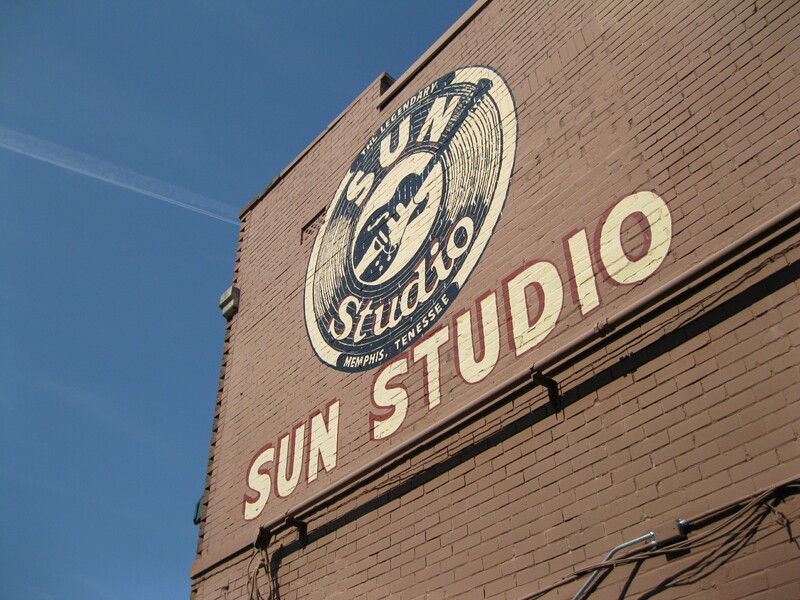 To this day Sun Studio is still an active recording studio. As soon as daytime operations of tours and the merchandise shop close down, the recording services start up at 19:00 hours. 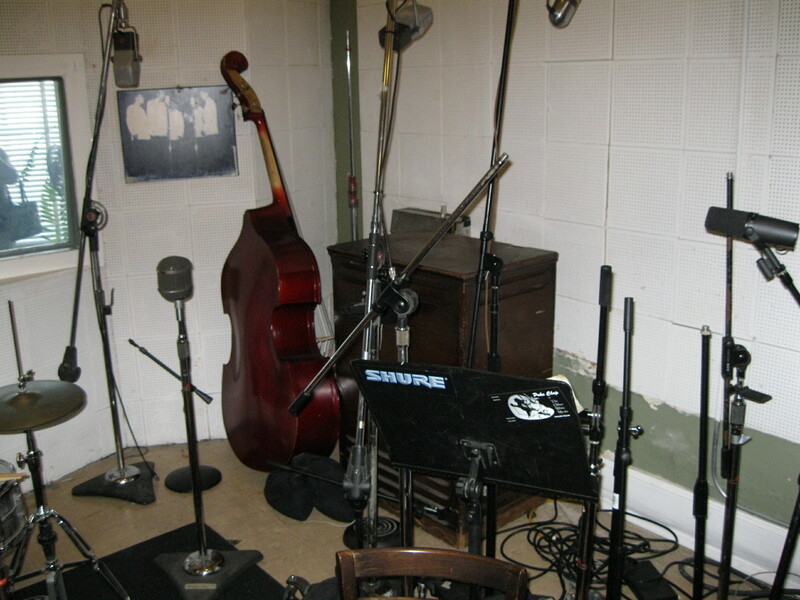 The studio offers a unique opportunity to record with the some of the original equipment Sam Phillips used. A combination of this analogue approach and modern day technology creates a remarkable sound. 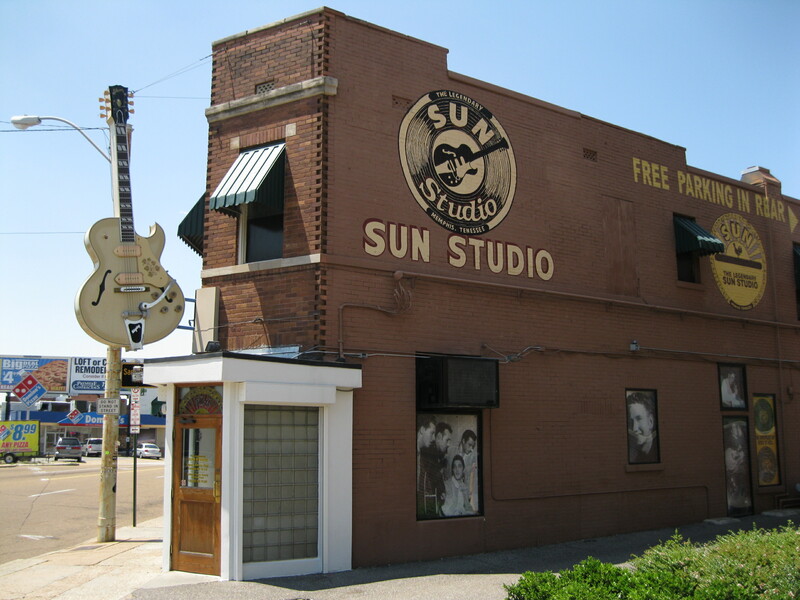 Sun Studio was declared a National Historic Landmark on 30 July 2003. Sadly, Sam Phillips passed away the day before this well-deserved acknowledgement. 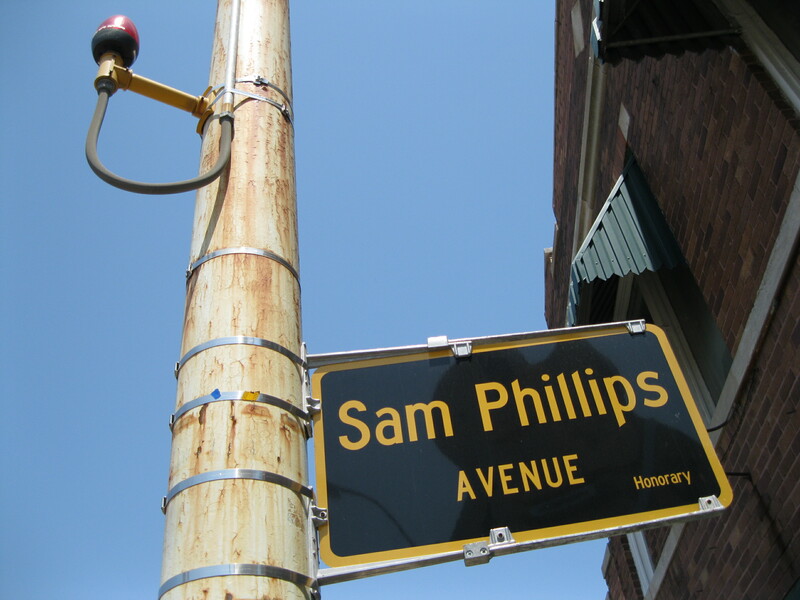 Outside the Sun Studio building, a street sign has been raised as a homage to Sam Phillips, naming it Sam Phillips Avenue. 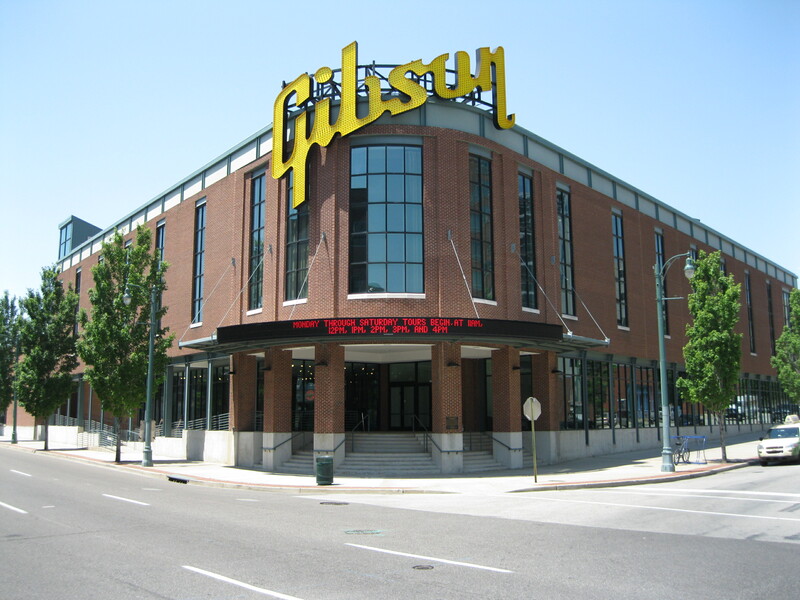 A very cool and underrated attraction in town is the Gibson Factory, located at 145 Lt. George W Lee Avenue just opposite the Memphis Rock’n’Soul Museum. 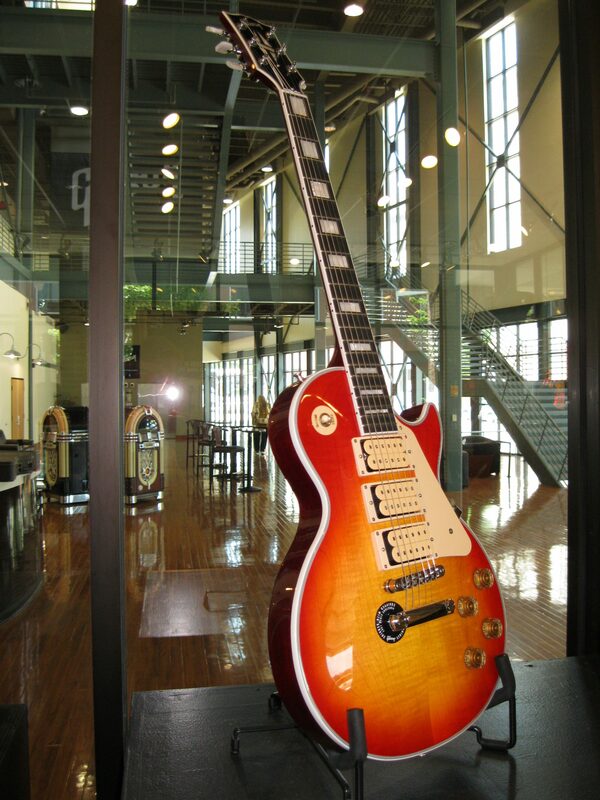 At the Gibson Factory in Memphis they specialise in manufacturing semi-hollow guitars. You can take a tour of the factory where you will get a unique insight on how these amazing instruments are created. 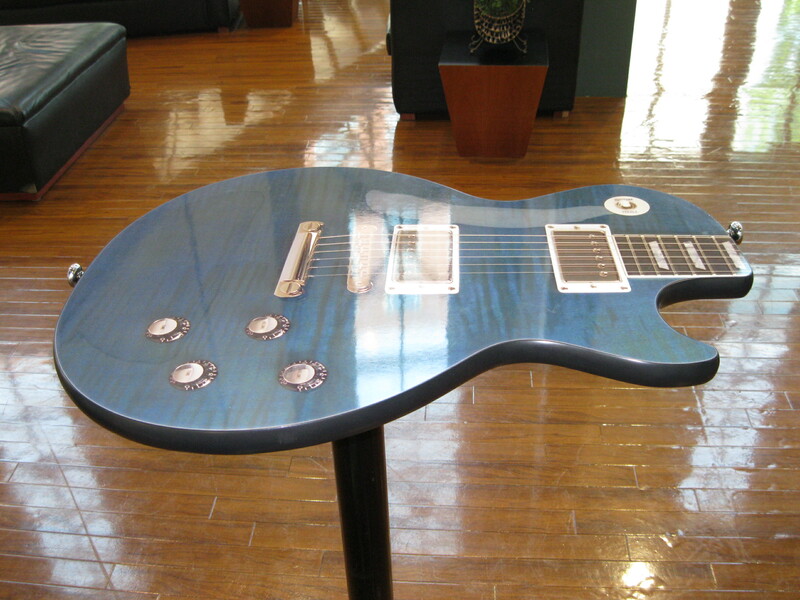 You may even see custom made guitars. Blues and rock guitarist Joe Bonamassa has previously had a custom made guitar made to his specifications right at this very factory. The tour is so fascinating especially if you are a music fan and a fan of guitar music. Photography is not allowed during the course of the tour. The guide will share some marvellous information on the production process of the semi-hollow guitars created on the factory by taking you through each production line step by step. The guitars are built through several phases by different people who are specialised in their individual field. Some work on the neck, some on the body, there are experts on tuning and there are people focused on the paint job and so on. The dedication and skills by these magnificent workers are simply awesome and witnessing it is absolutely unforgettable and an experience of a lifetime. The duration of the tour is between 45 minutes and an hour. Afterwards you have the opportunity to browse through the Gibson Retail store where they not only carry the semi-hollow guitars but also their other lines of guitars. You can also purchase some souvenirs here such as a t-shirt and guitar picks. Gibson as a brand is one of the most sold guitars in the world and also one of the most respected for its quality. The brand was one of the forerunners with regard to the breakthrough of the electric guitar in popular music in both jazz and especially rock’n’roll. The company was founded by Orville Gibson in 1902 as the The Gibson Mandolin-Guitar Mfg. Co., Ltd in Kalamazoo, Michigan. Gibson invented the archtop guitar which is a full body semi-hollow and semi-acoustic guitar, particularly popular in jazz, blues and rockabilly. 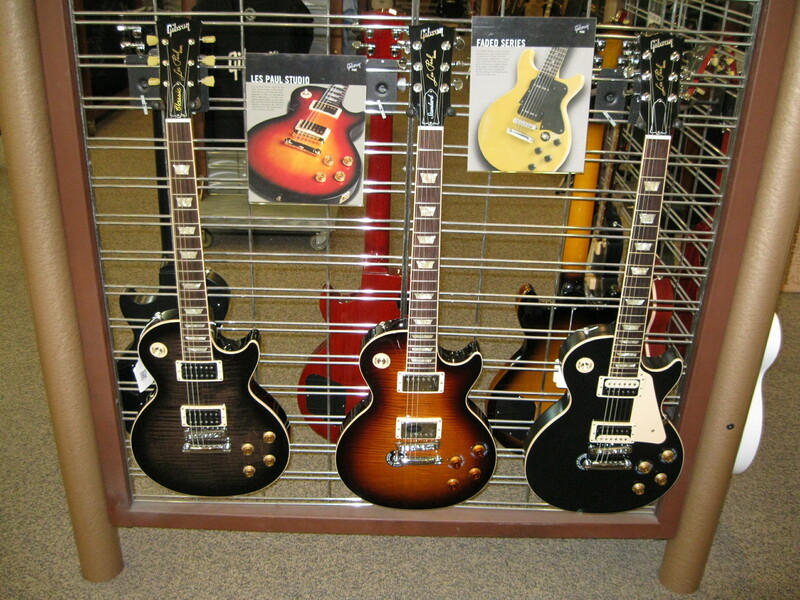 The most iconic brand of Gibson guitars is the Gibson Les Paul which is a solid body electric guitar. It was created by Gibson president Ted McCarty, factory manager John Huis and their team along with guitar legend Les Paul back in 1952. Les Paul was quite a ground-breaking musician and a rock’n’roll pioneer even though he is mostly known as a jazz guitarist. Not only was he a key factor in creating the solid body electric guitar for Gibson, but he was also an innovator when it comes to recording techniques with his experiments with overdubbing, delay effects and multi-track recordings. His distinctive playing style of licks, fretting, trills, chording sequences and timing would make him stand out and influenced many upcoming guitarists at the time and he still continues to do so even to this present day. Les Paul as a pioneer was very open and interested in the development of the guitar and the music that followed. In 1988 he invited another innovator of the instrument and currently the last to make a ground-breaking impact on rock’n’roll and music in general, Eddie van Halen, on to his TV-Special. Eddie was in awe of being on the show to perform in front of one of his biggest heroes and Les was clearly also very impressed with the level Eddie had taken guitar playing to by raising the bar even higher. Over the years Les Paul has recorded and performed with many other virtuosos of the instrument such as contemporary Chet Atkins but also Steve Lukather, Neal Schon and Richie Sambora. Also at his own Jazz, Rock & Blues Club in New York City, called The Iridium, he invited amazing guitarist like Joe Satriani, Eric Johnson, Larry Carlton and Tommy Emmanuel to play along with him. He clearly admired his guests, would tell old anecdotes, respectfully kid around with them using his own unique brand of dry humour and then finally enter a wonderful guitar collaborating live on stage. Paul McCartney visited the club once and went up on the stage and as a tribute to Les Paul he told him that at the very first gig that he and John Lennon ever did together before The Beatles were even formed, the first song they ever performed was “How High the Moon” popularised by Les Paul & Mary Ford back in 1951. Les didn’t know this as the time was very proud and surprised. The Gibson guitar is used by many of the most respected, highly skilled and ground-breaking guitarists around the world. One of the more recent guitar virtuosos to really have taken the Gibson brand on board is Joe Bonamassa who’ve had great success not only as a solo artist but also with the magnificent blues hard rock band Black Country Communion, the funk band Rock Candy Funk Party and his collaboration with blues singer Beth Hart. As mentioned earlier, Bonamassa has had custom made guitars manufactured at the Gibson Factory in Memphis. There have been many great ambassadors of the Gibson guitar over the years. Guitarists like Jimmy Page of Led Zeppelin, Mick Jones of Foreigner and Ace Frehley of Kiss really stand out as absolute legendary riff monsters on their Gibson Les Paul custom made guitars. Gibson manufactures an “Inspired by” series of Mick Jones’ Les Paul model, and they have released an Ace Frehley Signature model and a Jimmy Page Signature model Les Paul as well. John Sykes known for his work with Thin Lizzy and Whitesnake uses a 1978 Les Paul Custom model. He makes the brand proud with his amazingly fast and hard hitting riffs and solos with his own recognisable style. Al di Meola is a fusion pioneer guitarist known for his work with Return to Forever and his versatile solo career. He is also a keen user of the Les Paul fretboard, who really impressed Les Paul himself with his technical skills on the instrument. Some guitarist have made it a trademark to use other brands of the Gibson guitar such as Michael Schenker, formerly of UFO and since as the band leader in Michael Schenker Group. 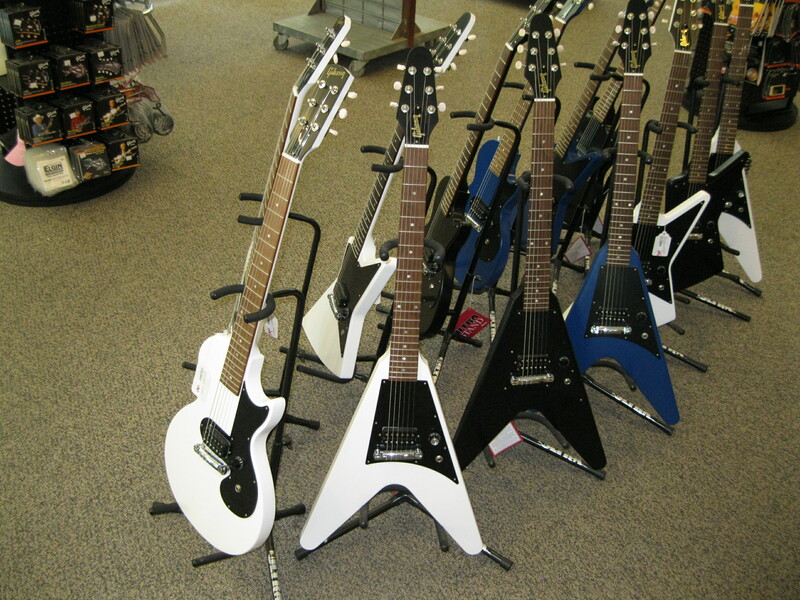 He is well-known for using the Flying V and is the forerunner in using this model. Lee Ritenour and Steve Howe of Yes and Asia fame, are both keen users of full-hollow body Gibson guitars. This fits in well with Ritenour’s brand of smooth jazz, but was quite a unique move for Howe as a guitarist for a progressive rock band such as Yes. Both are influenced by Wes Montgomery and are also known for endorsing the Gibson L-5 hollow body guitar. Both Howe and Ritenour use the Gibson Les Paul when they want a more heavy sound for their fusion and prog rock compositions respectively. Gibson has an ES-175 Steve Howe Signature model which is a full hollow body and a Lee Ritenour Model Archtop. Ritenour is also known for using the Gibson ES-335 semi-hollow guitar. Guitar maestro Gary Moore became an endorser solely of different versions of the Les Paul model relatively late in his career when he more or less converted from hard rock to the blues rock. Gibson released two different signature models in his name. One model was reconfigured to match the unusual modification of a version for Peter Green, one of Moore’s main influences. Rock’n’roll pioneer Chuck Berry was loyal to the Gibson brand his whole career mainly using the semi-hollow Gibson ES-335 and Gibson ES-355 guitars. Located at 191 Beale Street just opposite the Gibson Factory you will find the Memphis Rock’n’Soul Museum. This is an excellent museum where you can have a mosey around checking out all the many musical items and informative displays that will lead you through the history of rock and soul music. It will tell you the story of the pioneers who created the music in spite of racial and social barriers and poverty. This wonderful exhibition covers everything from the rural field hollers of the 1930, to the recordings of Sun, Stax and Hi Records to the influence the Memphis music scene had on the whole world. The audio tour is highly recommended which has more than 300 minutes of information including over 100 songs. By choosing this option you can walk through the museum at your own pace, exploring the seven galleries where you among other things will see more than 30 instruments, 40 costumes and many more artefacts. On display are marvellous artefacts such as an old battery operated radio, a hand-crank record player, classic vintage recording equipment from Sun Studio dating back to around 1953 used to record the first session with Elvis Presley as well as work by Carl Perkins, Johnny Cash, Jerry Lee Lewis and Roy Orbison. The exhibit has B.B. King’s iconic hollow-body Gibson guitar which he named Lucille, being one of the most legendary features of the establishment. 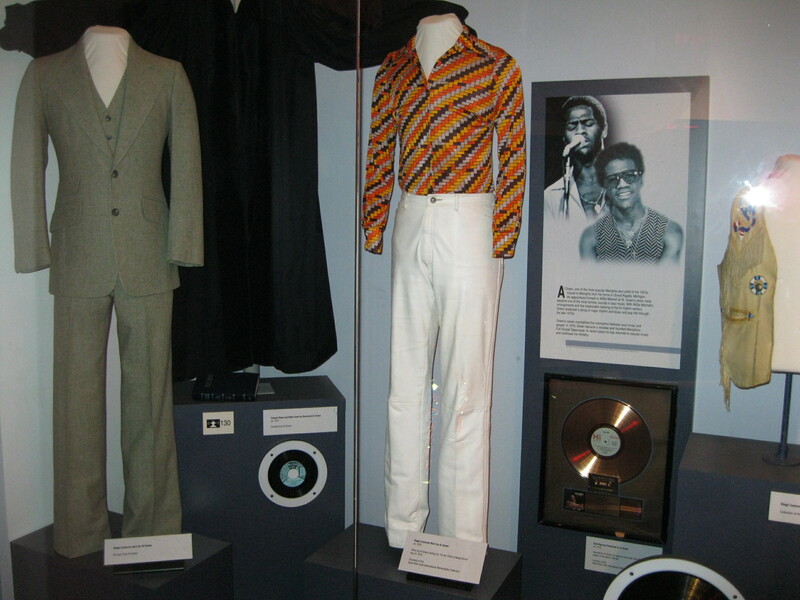 A racy outfit and a more conservative suit worn by soul singer Al Green can be seen as well on your stroll through the museum. 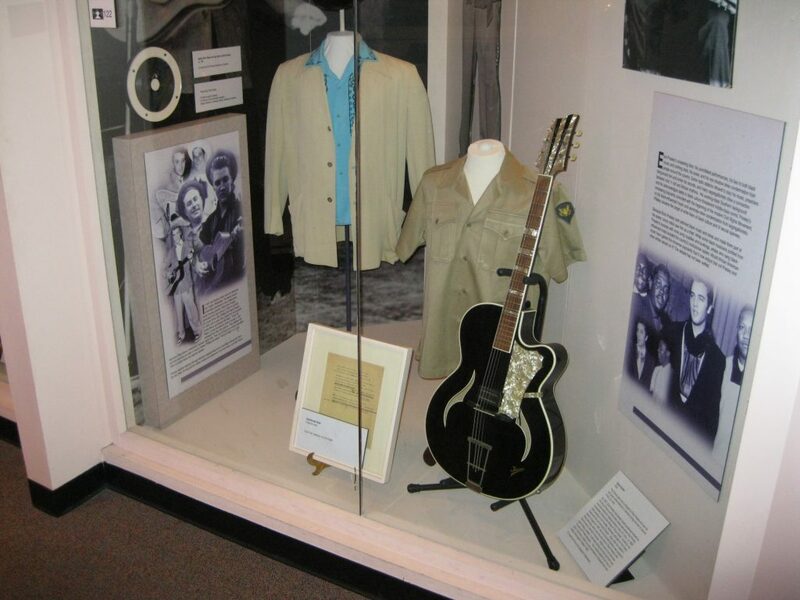 Phenomenal artefacts such as the original lyrics for the Elvis Presley classic “Heartbreak Hotel” are also among the unique treasures alongside original Elvis outfits and his Isana Guitar from 1958, which was his only guitar while stationed in Germany during his service for the US Army. Not to mention the original Hammond organ and Fender guitar used by Mark James to compose the Elvis Presley hit “Suspecious Minds” along with the original handwritten lyrics. James was certain that the song would be perfect for Elvis and he was clearly right. This would be The King’s final no. 1 song on the Billboard Chart during his lifetime. James’ equipment is appropriately accompanied with one of Elvis’ funky jumpsuits from the 1970s. Just before departing the exhibition you have to the opportunity to “record yourself in Memphis” as it says. Leave a comment on a post-it note on their noticeboard. This is a cool like gimmick which gives you an opportunity to express what you liked about the museum or Memphis in general. Leave your name and hometown on the note and it may just be posted on their Facebook page or website. One of the sights in the town of the utmost historical significance is the National Civil Rights Museum. 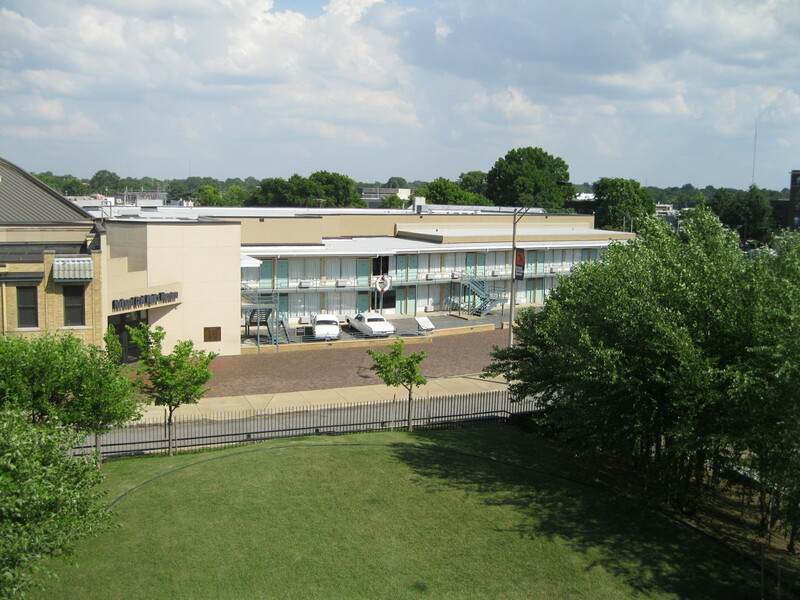 The museum was built around the former Lorraine Motel, mainly as it was the location of the assassination of civil rights activist Martin Luther King back on 4 April 1968. Two other buildings and their adjacent property, connected with the assassination, were acquired and are a part of the museum complex. The museum opened to the public on 28 September 1991. It’s based in the South Main Arts District on the outskirts of Downtown at 450 Mulberry Street, about a 10 minute walk from the western section of Beale Street. 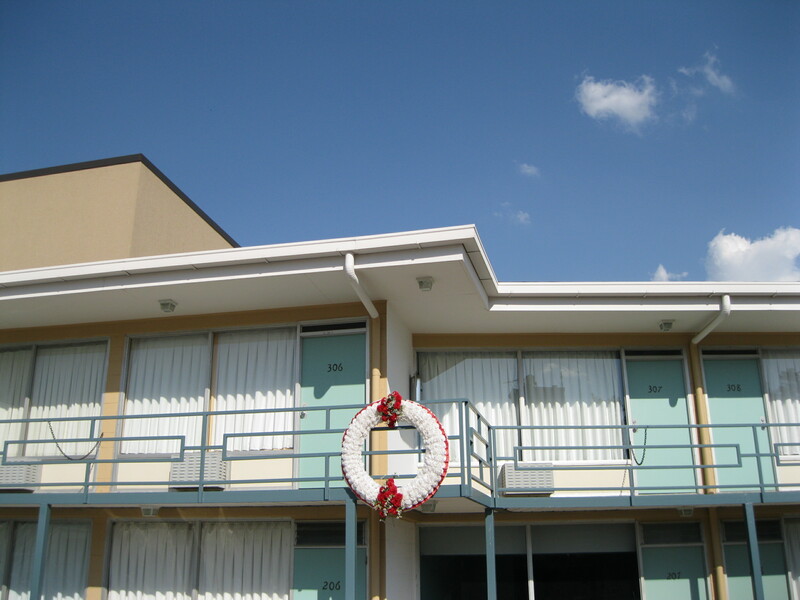 As you are facing the museum and the old Lorraine Motel, you will notice a big wreath displayed on the outside the balcony of room 306 which King was booked into and where he was assassinated. The building is well maintained and kept authentic. It still has the original motel sign displayed on the property. Visiting the museum is recommended as it will take you on a journey through the history of the civil rights movement with informative displays and authentic artefacts. The permanent exhibits stretch all the way back in history to the times of slavery to the civil war, to the protests in the 60s and all the way up to the late 20th century. One of the centrepieces is a reconstruction of an event back on 1 December 1955 in Montgomery where Rosa Park, who was employed as a secretary, boarded a bus after a long day at work. She placed herself on a seat just behind the “whites only” section in the bus. As the vehicle filled up with white passengers, the “whites only” sign was moved behind her seat to make place for the on-boarded white people. She refused to move and was consequently arrested by the police. As you enter the bus it will take you back to stage of the incident. 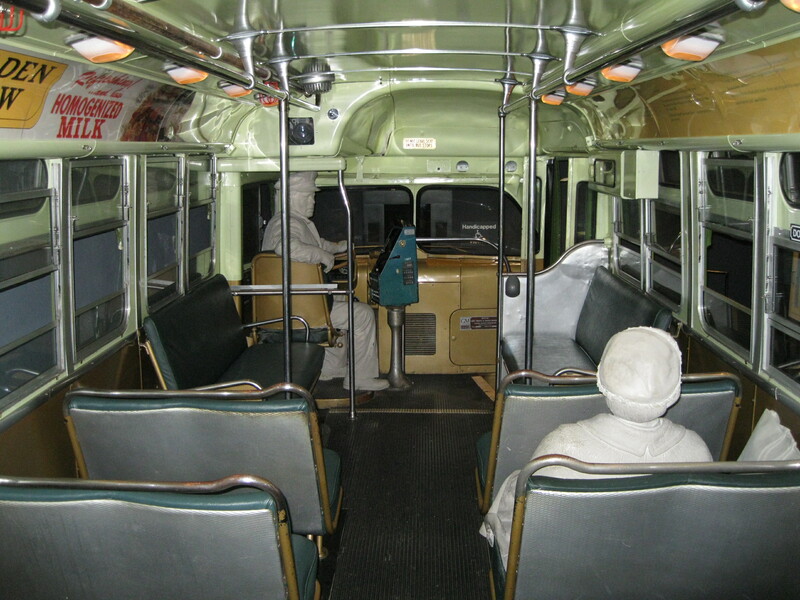 Before you a model of Rosa Park is displayed, firmly placed in her seat. Imagine all the turmoil in the bus at the time. The highlight of the museum on this side of Mulberry Street is entering the actual Lorraine Motel and having look at room 306 where Martin Luther King spent the last hours of his life before his assassination. Room 307 has been removed to accommodate the public viewing area of room 306. As you look out the window you will see the wreath on the balcony and the old boarding house across the street from which the shots were fired. Incredible to be standing right where this pivotal moment in history took place many years ago. Opposite the Lorraine Motel, the Legacy Building is located. This is the location of the old boarding house from which the assassin’s shot was allegedly fired. 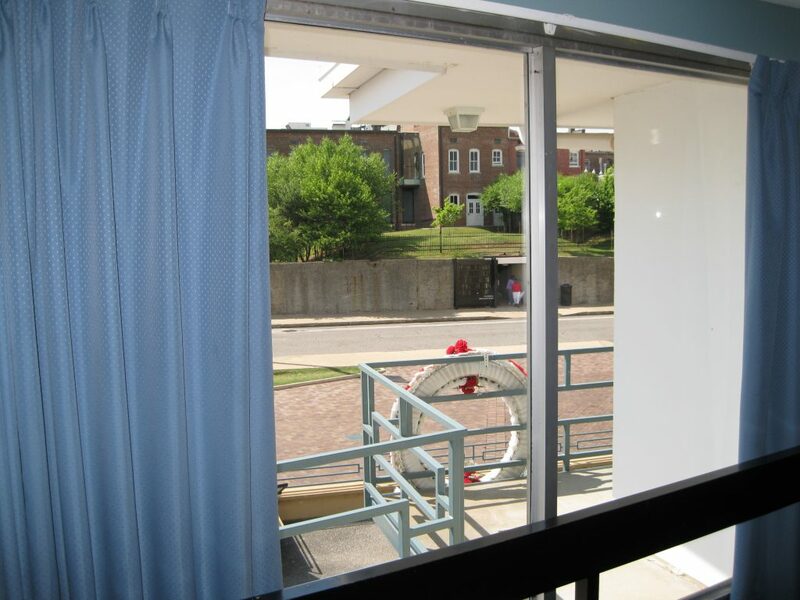 This part of the museum begins with the timeline and history of the Civil Rights Movement displayed in the exhibits in the museum on the Lorraine Motel side of Mulberry Street right up to the assassination of Martin Luther King. The second floor is by far the most fascinating and intriguing part of the museum which thoroughly takes you through the investigation of the assassination of King, the case against James Earl Ray and the conspiracy theories in that respect. The room from which Ray allegedly shot King is on display. Quite mind-blowing imagining that that was the room a major historical figure like King was shot from. You can’t get into the room as it is closed off with protective glass. You are able into look into it and stand only a short distance away from where investigators believe the assassin shot Martin Luther King. You can get a similar view from the neighbouring room from the windows. This exhibit on the investigation of the murder of Martin Luther King is really the centrepiece of the Legacy Building. Following the process on the displays and exploring the artefacts is captivating. 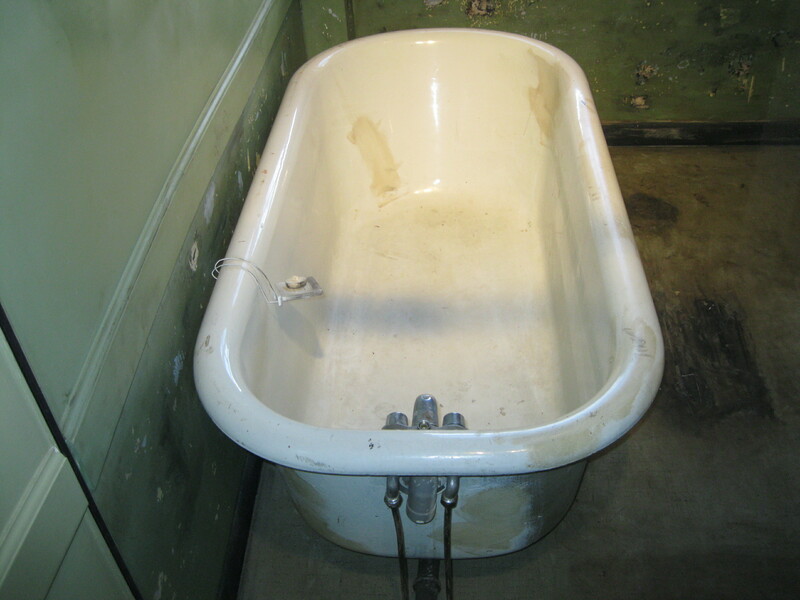 You can explore everything from photos from the boarding room towards the Lorraine Motel taken only days after the murder, to artefacts such as the gun, binoculars, newspaper articles and photos related to the investigation. There’s a fascinating display with regard to the Coretta Scott King vs Loyd Jowers case from 1999. Jowers owned Jim’s Grill located just opposite the Lorraine Motel. Jowers claimed that Ray was a scapegoat and that he wasn’t the only perpetrators. He said it was a conspiracy involving the Mafia and the US Government. 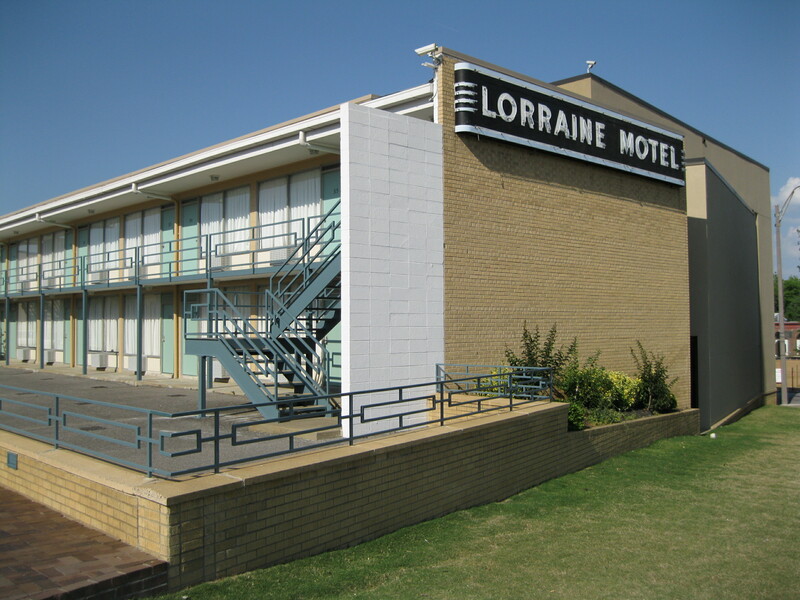 Jowers claimed that he hired a Memphis police man, Earl Clark, to shot Martin Luther King from the brushy area just across the street from the Lorraine Motel. James Earl Ray, who was a fugitive from the Missouri State Penitentiary, was arrested in London on 8 June 1968 charged for the murder. I pleaded guilty on 10 March 1969 and was sentenced to 99 years in prison. He later tried to withdraw his guilt unsuccessfully and died in prison on 23 April 1998 at the age of 70. One of the biggest sights in town is Graceland, the former home of singer and entertainer Elvis Presley. Even if you may not be a fan of Elvis Presley, a visit to the estate, which now serves as a museum, will be very interesting. There is something for everyone to enjoy, from wonderful architecture and classy décor to flashy cars and luxurious planes to any sort of Elvis souvenir you can imagine. Some people are concerned that Graceland is tacky and touristy and therefore rule out a visit or are very complaisant about going. It is touristy which is impossible to avoid due to the many visitors, but it is all done in a very tasteful manner and it’s all a great homage to Elvis. 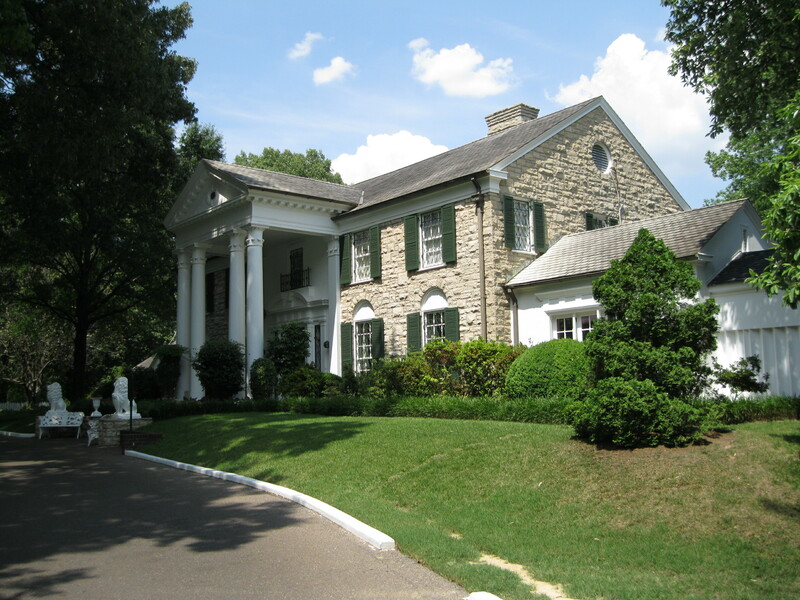 The mansion is located at 3764 Elvis Presley Boulevard which is 14.5 km (9 miles) from the Downtown area of Memphis. A shuttle bus leaves from Sun Studio at 706 Union Avenue which takes you to and from Graceland. This is a very convenient way of going if you don’t have you own vehicle and then you don’t have to worry about parking. Graceland has become a massive tourist attraction due to the gigantic impact Elvis Presley had on the music scene as he entered in 1954 and became the biggest entertainer in modern music history, nicknamed “The King”, a title that will not be taken away from him in the foreseeable future. If you are a fan of rock’n’roll and music in general you have to pay Graceland a visit as it in one of the biggest music shrines in the world due to the fact that it was the home of Elvis Presley. There have been several huge artists, bands and entertainers in the 20th century before and after Elvis, but not many came close to the huge influence he had as a single person on the music scene and popular culture with regard to not only music, but also fashion, design and lifestyle in general. This is a very impressive effort by one single man. Not only was Elvis a uniquely gifted singer and entertainer but he also had amazing charisma and a presence that did make him seem like the King of all music and entertainment. As mentioned earlier you have the option of taking the shuttle bus from Sun Studio which is convenient. Upon arrival you have to go to the ticket office to either purchase a ticket or convert your voucher to a ticket if you have prepaid. It’s a massive facility. Besides the main attraction of the Graceland Mansion on the western side of Elvis Presley Boulevard, Elvis’ Airplanes and Elvis Presley’s Memphis are located on the eastern side. The latter is a big complex of entertainment, exhibits, restaurants and souvenir shops. You will be exposed to an abundance of all things Elvis. The experience is sure to get you “all shook up”. 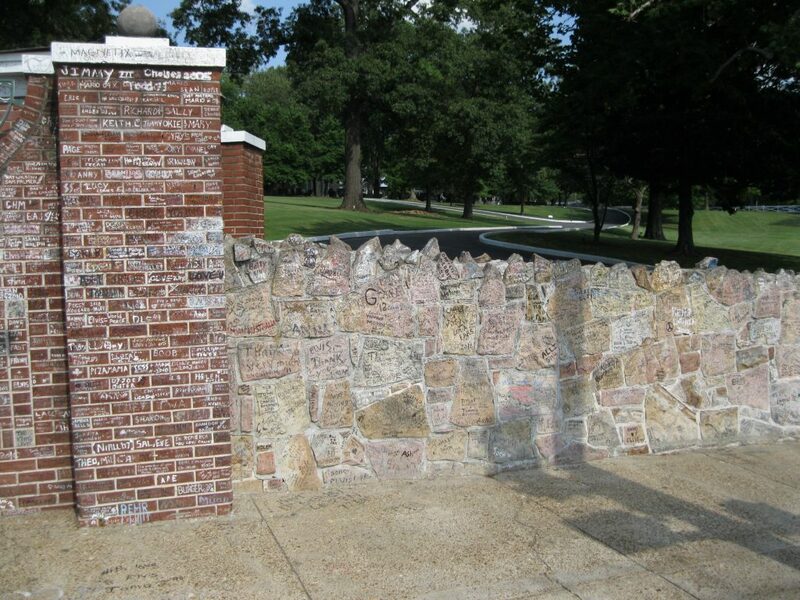 Graceland was built in 1939 and bought by Elvis Presley in 1957 for 102,500 USD. The grounds on which the mansion was built were named after the daughter of Stephen C. Toof, who originally owned the Graceland Farms. Grace inherited the farm in 1894. After her death, the land was passed on to her niece Ruth Moore who together with her husband Thomas Moore built the mansion. The family before Elvis lived on a 600 acre (2.43 km2) farm and Elvis only bought 13-14 acres (52, 609 m2) of the land. Graceland is a two-storey mansion designed in style of Colonial Revival with a central pedimented portico with pilasters and Corinthian-type columns. It’s been described as a five-bay residence, referring to five openings for doors and windows across the façade. The siding is tan-colours limestone mined in Mississippi. 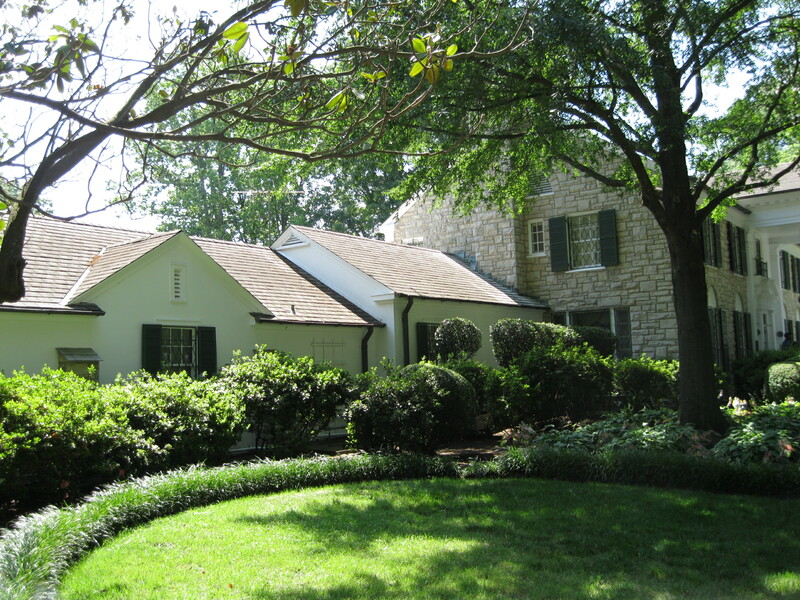 Elvis bought Graceland for his parents and himself. At the time the property was located several kilometres beyond urban Memphis. In later years, the city would expand and Graceland became surrounded by other properties. Elvis’ mother Glady passed away in 1958. His father Vernon remarried in 1960 and he and his wife would stay at the mansion for sometimes. There was some friction between Elvis and his stepmother, so she would only end up staying at the mansion when he was away. Graceland also became the home of Elvis’ organisation which was a clan of Presleys and so-called deputy Presleys enjoying Elvis gratuities among other things. Priscilla Beaulieu lived at Graceland from 1962, before they got married in 1967, until their divorce in 1972. Their daughter Lisa Marie was born in 1968 and spent the first years of her life at the property until the divorce. 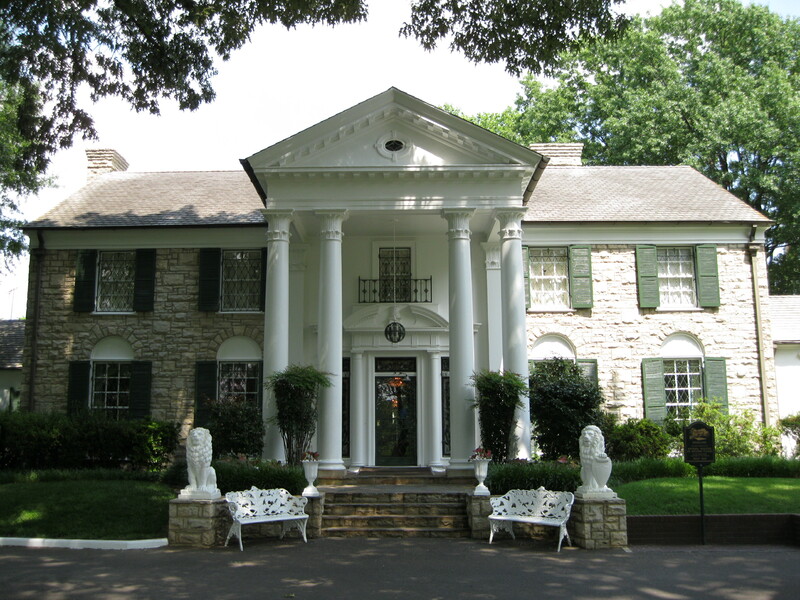 Graceland was the home of Elvis Presley until his passing on 16 August 1977. 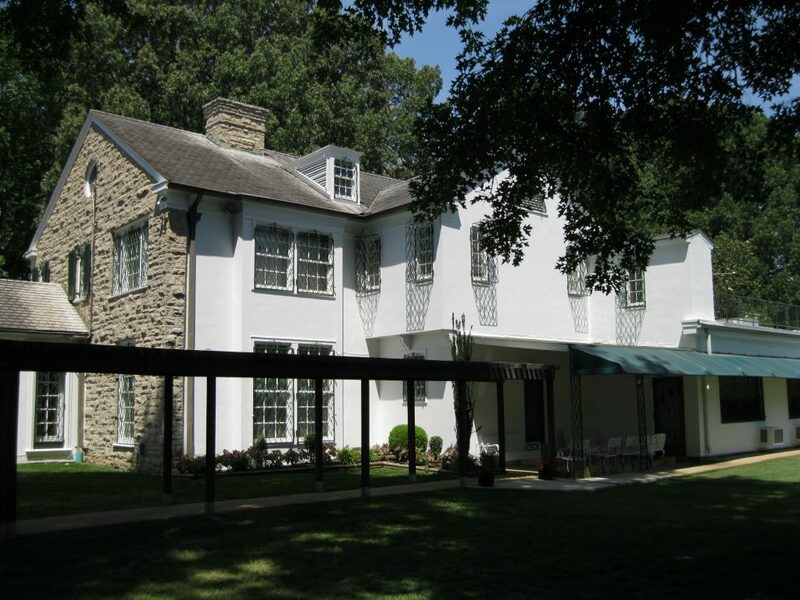 On 7 June 1982 the estate was opened to the public, it was listed in the National Register of Historic Places in 1991 and was declared a National Historic Landmark in 2006. It is the 2nd most visited house in the United States only surpassed by the White House in Washington, DC. Once your ticket has been sorted you have access to the shuttle bus that takes you on a short ride from shuttle bus loading/unloading area across Elvis Presley Boulevard through the gates of Graceland to the mansion. There will be a guide on the bus sharing some interesting information on the way, all served up with some southern hospitality. The bus drives up the driveway through the beautiful and well maintained front yard and terminates right outside the entrance of the mansion. Check out the wonderful Graceland structure before entering. You may just be able to get a good shot of the entrance without any people in the shot if you are lucky. You have to be quick are there are many people visiting. Have a stroll around and check out this magnificent building and the lovely garden area leading up to the entrance. In front of the mansion you may notice two marble lion sculptures. A fun fact is that these lions were from a property on Cherry Road, a couple of blocks from Elvis’ first home at Audubon Drive. When Elvis bought Graceland, he visited the owner of the lions on Cherry Road and asked if he could buy the lions as he loved them so much and they were moved to Graceland. Another interesting fact is that Elvis kept all his receipts which is why there is so much knowledge of the stories behind the different items at the mansion. The first stop as you enter the mansion is the foyer where you will have great views of the living room, dining room, the stairway leading upstairs and the mother’s bedroom a bit further down the hall. It is not possible or allowed to go upstairs. Officially due to the family’s privacy. 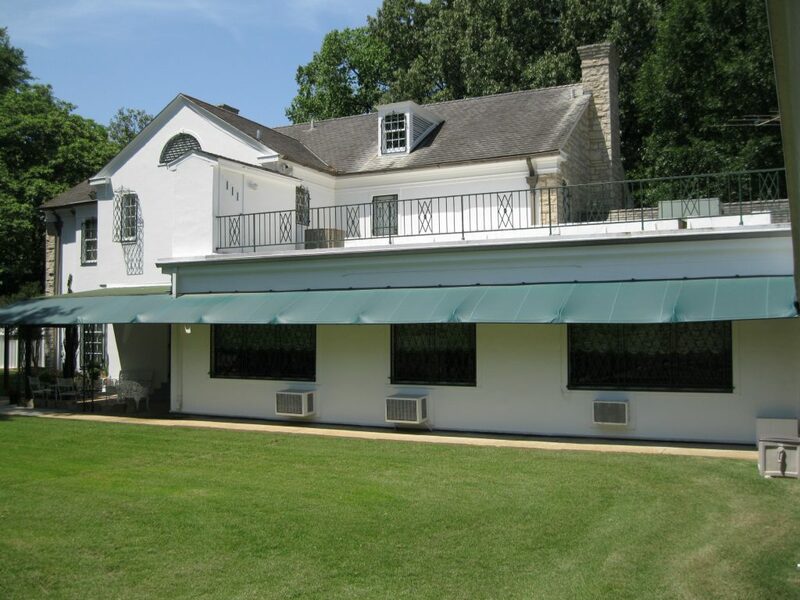 It is said to even when Elvis lived at Graceland this was a very private part of the mansion. 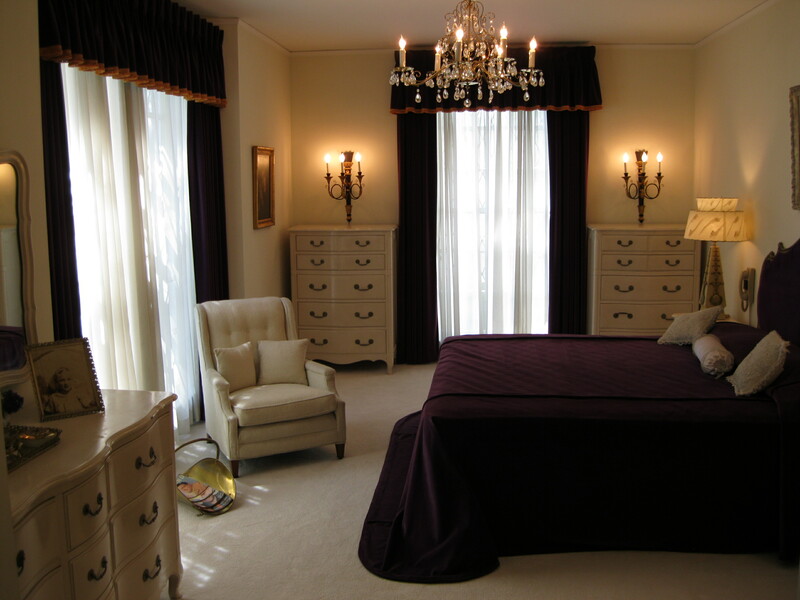 Upstairs is the location of Elvis’ bedroom, his office, his dressing area and Lisa Marie’s room. This part of the mansion has only been seen by family and close friends. The main reason was it is not open to the public is probably because The King died on his throne upstairs so to speak and the family and estate are not interested in any sort of speculations in that regard. But also like Elvis’ close friend Jerry Schilling said, Elvis always had some mystique about him, he would never let you know everything and Graceland has the same mystery with the upstairs section. Elements of the décor throughout Graceland span from different periods of the Elvis eras at Graceland but look is primarily of the late 1960s to early 1970s incarnation. 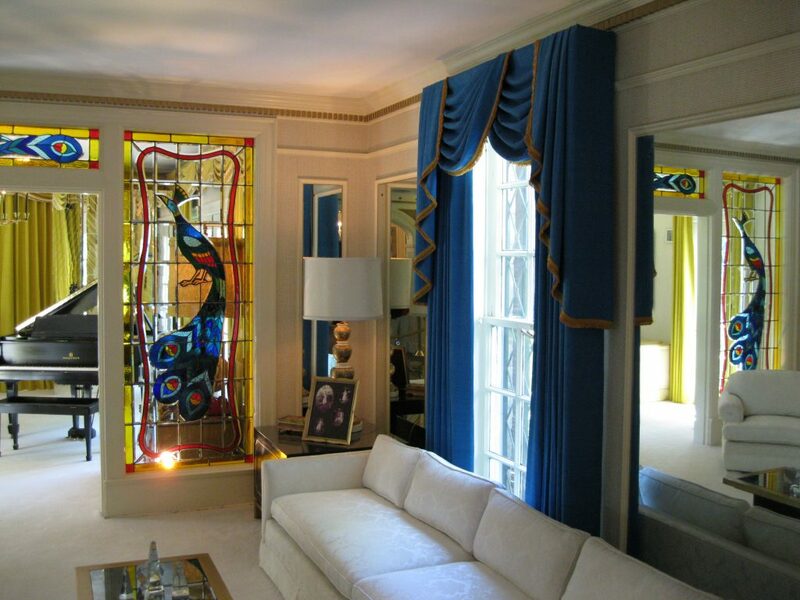 As you will notice Elvis’s style was always on the cutting edge which is evident in the trendy décor. Certain parts of the mansion are closed off with rope barriers such as the living and dining rooms, but you can watch and photograph from a distance. The foyer was the place where special guests would be received and thereafter shown to the living room where Elvis come and greet them. 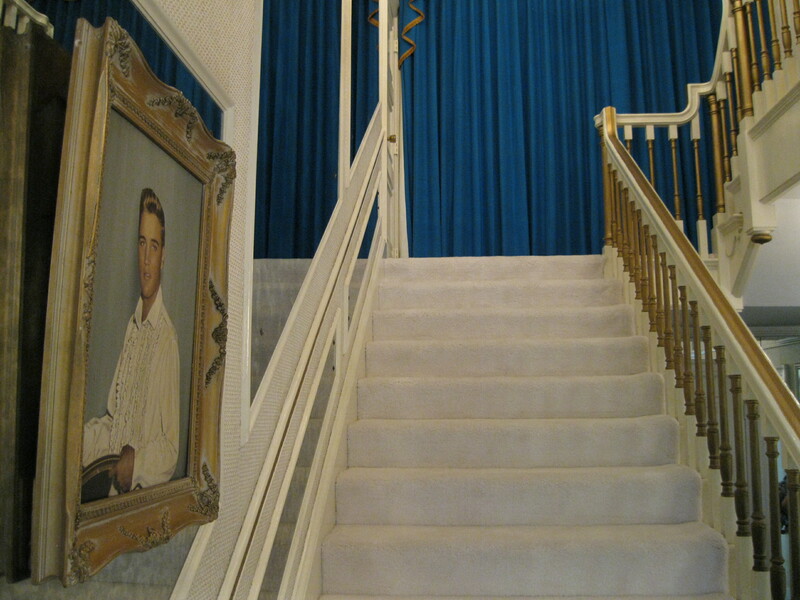 The picture seen of Elvis to the left when looking up the stairs is an oil painting of a photo of him in Texas from when he was in the army. A fun fact is that a DJ from Tulsa, Oklahoma had come up with a stunt that Elvis should ride a bike from Tulsa to Fort Hood for an interview. On the picture you see Elvis holding that looks like the backrest of a chair. This is actually the rim of a bike. There is a promotional photo of Elvis holding the rim of a bike which this painting is based on. The picture has been on the exact spot since the 1960s. What you may also notice, that since this photo was taking during his army time, he didn’t dye his hair black, so you will see his natural hair colour which was more of a light sandy blond. The living room is adjoined with a music room through a doorway framed with large peacocks in stainless glass. The music room has a grand piano and a 1950s style television. The living room has a 4.6 metre (15 ft) long custom made white sofa, two white chairs of similar design and 3 metre (10 ft) custom made coffee table. It’s probably the most beautiful room in the mansion, very light due to the white colours of the carpet and furniture with bright yellow and blues colours at the end at the doorway. 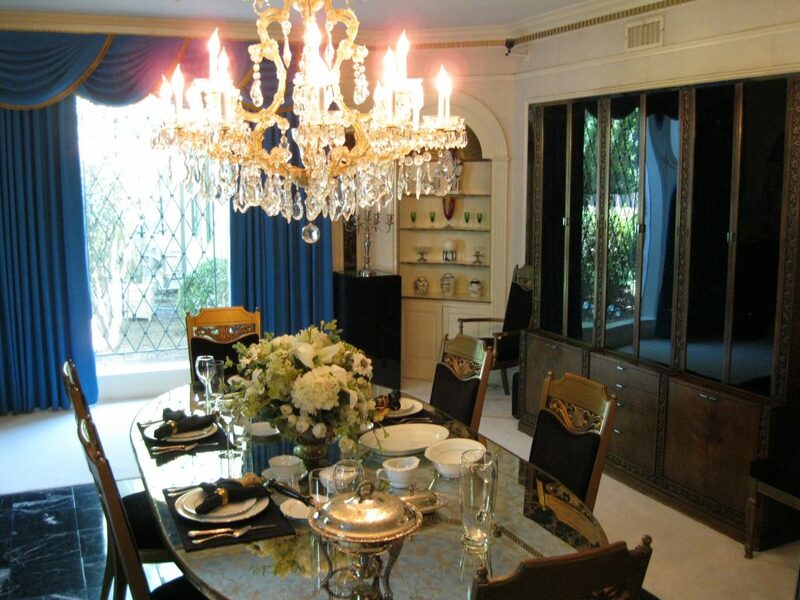 All the furniture in the living was made for Graceland when Elvis bought the home in 1957. The music room was where the family would entertain close friends. Elvis would sometimes play the piano or the guitar and the some of the guests would sing along and harmonise with him. Elvis would have a lot of impromptu jam sessions, he would play the piano by ear as he never had any piano lessons. It wasn’t unusual to have southern gospel music to come out of this room through all hours of the night. A fun fact is that the only music class he took in high/middle school he failed. Imagine the kind of magic that would have happened in the music room. If the walls could talk they would tell some astounding tales. Elvis is probably one of the most photographed people in the world, but another interesting fact is that there are not many photos of him at Graceland. It was it private space where he could get away and just be himself. The piano in the music room has been in the room since 1974 and is one out of three that has sat in the room throughout the years. The dining room looks quite formal. The family wouldn’t have formal dinners every night but when they did, Elvis would sit at the end of the table, being the head of the table. A fun fact is that there is a button under the table where he would buzz the kitchen if he needed something even though it was just next door. 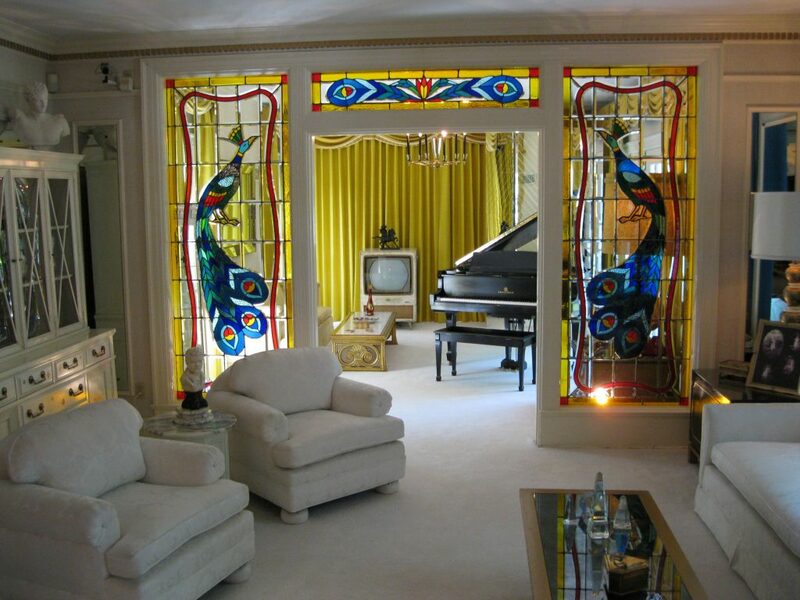 Another interesting aspect of the dinning room is the television located in the corner of the room, as it was quite unusual to have many tv’s as they had at Graceland, 14 in total, but as he was a recording artist at RCA they gave him what he wanted. As you walk from the foyer down the hall past the staircase you will get to the bedroom of Elvis’ mother Gladys. This room was used by Elvis’ aunt until her passing in 1993 and it wasn’t until then that everything was catalogued by Graceland and it was set up like when Gladys lived in the room and it was opened up for tours. Note the picture of a very blond five year old Elvis on the cupboard, taken in Tupelo, Mississippi. He already had a curled lip back then. Classic! Just opposite Gladys’ bedroom you will find the stairs that lead down to the TV room in the basement. When Elvis bought Graceland in 1957 the TV Room was just a basement. He turned it into a cosy area for informal entertainment with the three television monitors as a vocal point. Elvis decided to get three television sets when it came to his attention that President Lyndon B. Johnson had three television sets as well, one for each major network. Above is a pull-down movie screen where Elvis would watch home movies and feature films. To the right a built-in jukebox is located that holds 100 records that could be heard through speakers all over the house. 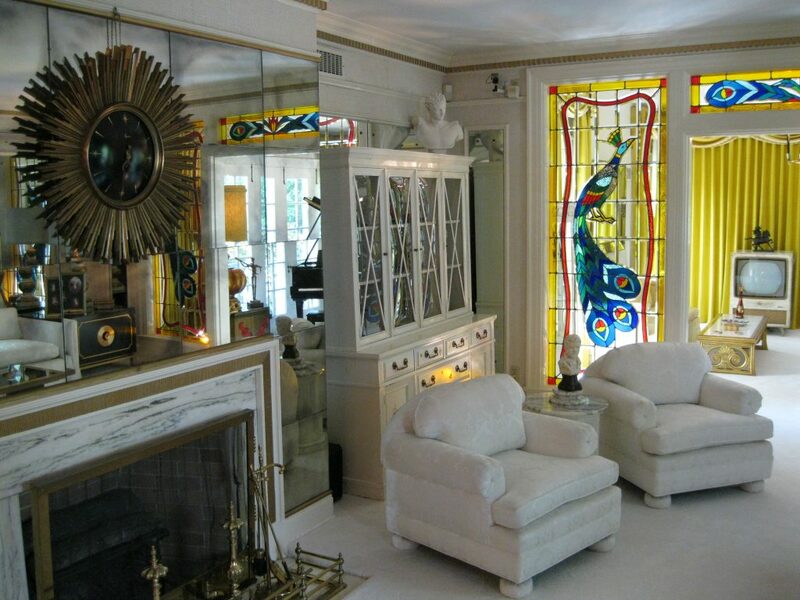 Everything you see in this room was a part of a redecoration that Elvis commissioned in 1974. The lightning bolt seen on the wall is a part of the TCB logo, Taking Care of Business in a Flash. 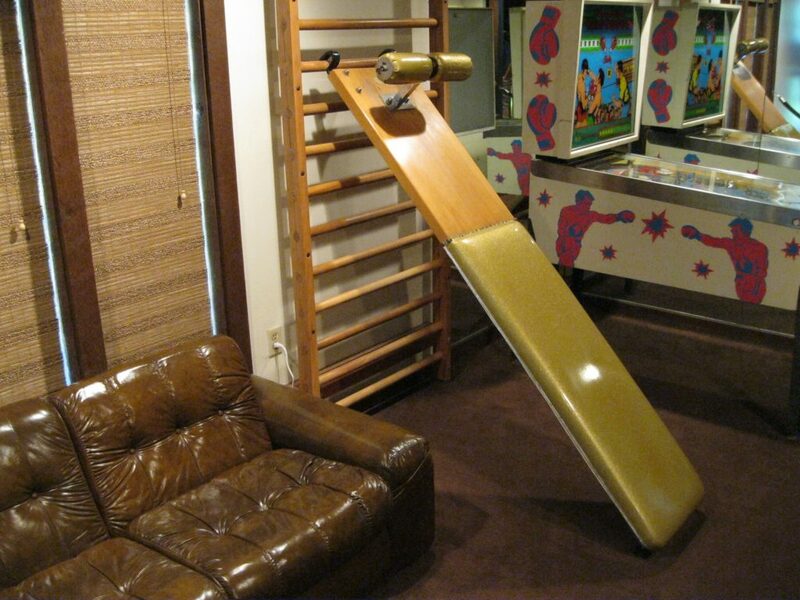 With the addition of the bar this is the ultimate man cave. 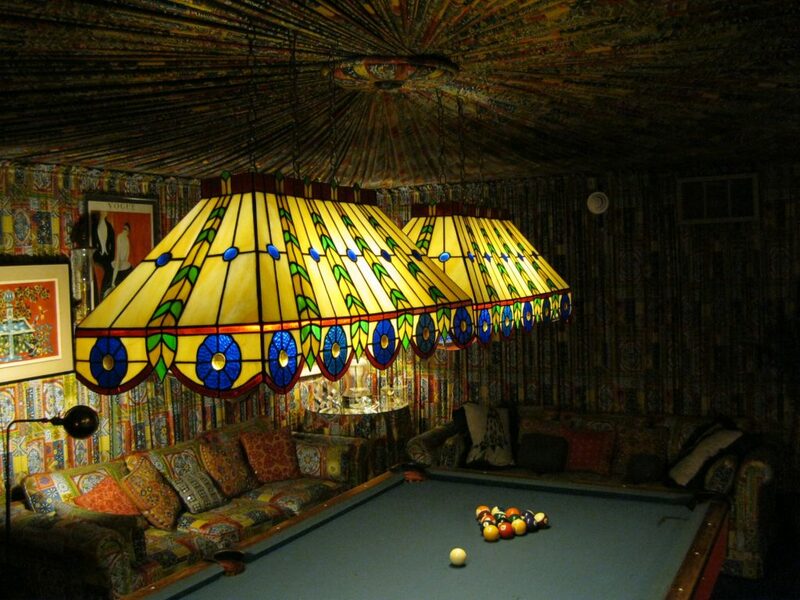 Across the hall from the TV Room you will find the Pool Room, another gathering place for Elvis and his mates. Elvis liked the game and was competitive. The current design was also a part of the redecoration of the basement in 1974 along with the TV Room. The walls and the ceiling are covered with a colourful cotton fabric. It took three workers ten days to cut, piece, hand and pleat it. The pool table is one of the oldest pieces of furniture at the mansion. Elvis bought the pool table right after he came back from the army from a local shop in Memphis. The pool table has been preserved as it was when Elvis last played pool on it back in the last 1970s. A fun fact is that the tear in the felt is a result of an unsuccessful trick shot by one of Elvis’ mates. Imagine all the conversations Elvis would have had with his friends in these cosy and funky surroundings. The kitchen located right next to the Jungle Room is very much a 1970s working kitchen from the design to the appliances. A lot of great southern cooking was made here and like in any southern home this was the heart of the home. Elvis was quite on the forefront at the time with gadgets and equipment as he had a trash compactor, a dish washer, a microwave and high-tech stove which were quite unusual for the 1970s. The Jungle Room is quite astounding with it’s interior reminiscent of Polynesia with its green shagged carpets but on the floor and on the ceiling, and carved wood furniture. 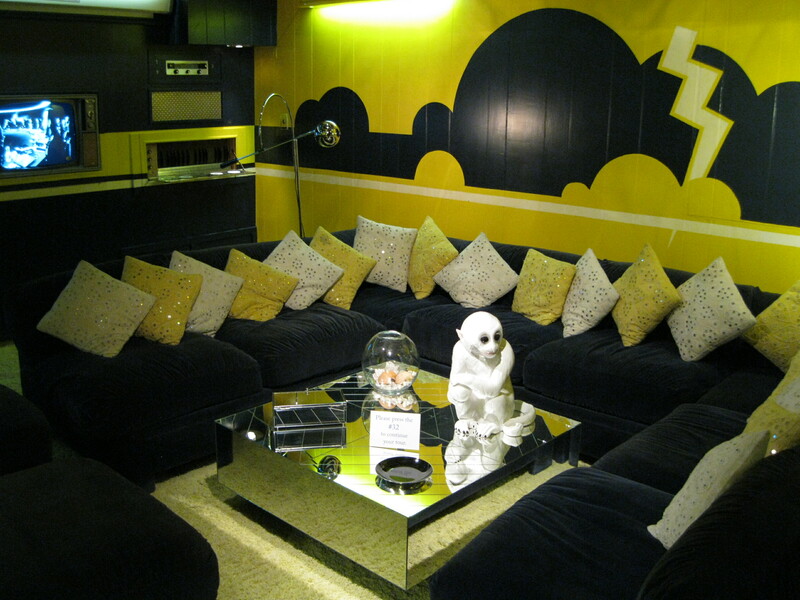 This is probably the coolest room at Graceland. Note all the miniature sculptures of animals. A really awesome item is a statue of the patron saint of animals, St. Francis right in the corner by the waterfall overseeing the care of all the animals. The room has undergone several incarnations. 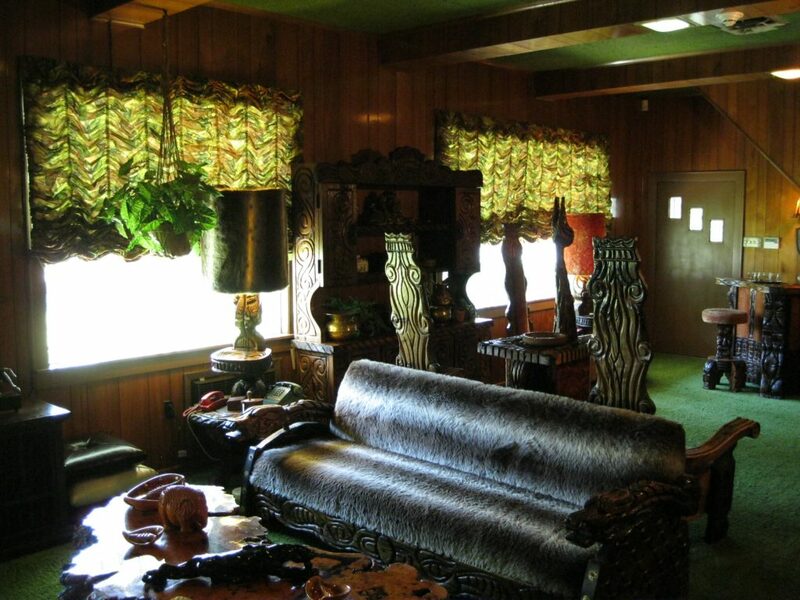 In 1974 Elvis redecorated it with the current furnishings which he found in a Memphis furniture store. The room became a favourite in the family and Elvis liked it as it reminded him of Hawaii where he loved to go on holiday, to film and perform. 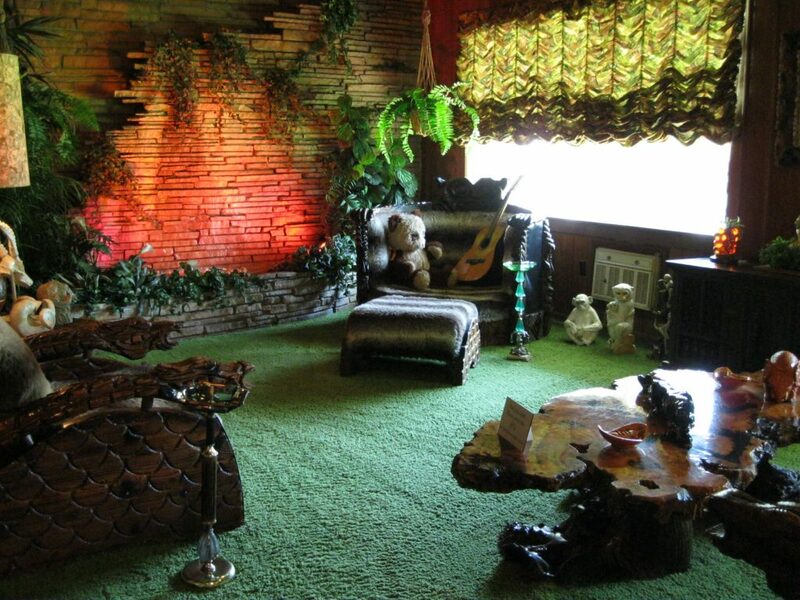 Elvis actually didn’t call it the Jungle Room himself, but the Den. A travel writer visited in 1982 when Graceland opened for tours and called it the Jungle Room and the name has stuck ever since. You may notice walking around the mansion that there are not a lot of clocks around. You could say that time didn’t exist while you were at Graceland. A fun fact is that the Jungle Room is one of the few places that have clocks. It is made out of the same wood as the tables to match the décor with coins engraved going around in a circle to tell what time it is. This item can be difficult to spot when doing the tour from the angle you will be walking. In February and October of 1976 Elvis did his final recording sessions in the Jungle Room known as the “Jungle Room Sessions”. The bulk of material was mainly released on the brilliant record “From Elvis Presley Boulevard, Memphis, Tennessee” on 1 May 1976 and some was released the following year on 19 July 1977 on “Moody Blue”. To prepare for the recordings they put blankets on the walls to improve the sound, while the carpets on the floor and on the ceiling were perfect for the acoustics. As Elvis and his musicians were playing inside the Jungle Room at Graceland, an RCA truck was parked outside to record the music. Prior to this session, Elvis would drive to the RCA Victor Studio in Nashville to record, but this time he didn’t feel like taking the trip. RCA agreed to bring the studio to Elvis instead, so he just had to walk down his stairs at Graceland to begin the recording. It’s quite noticeable that there’s a theme going through the sessions and the album “From Elvis Presley Boulevard, Memphis, Tennessee”. The songs are quite dark with titles like “Hurt”, “The Last Farewell”, “Never Again”, “I’ll Never Fall In Love Again”, “Love Coming Down”, “Blues Eyes Crying In The Rain” and “Solitaire” which shows that he was going through some emotional turmoil. An interesting fact is, that Elvis had a 1967 single of the Tom Jones version of “I’ll Never Fall In Love Again” in his personal collection. He also had the album “You’ll Never Walk Alone” from 1954 by Roy Hamilton, whom he loved to listen to, on which the song “Hurt” was originally recorded. This is one of the strongest songs on “From Elvis Presley Boulevard, Memphis, Tennessee”. These recordings most likely influenced him to record these tracks. To prepare for the recordings they would remove the furniture and set up a whole studio in the Jungle Room with all the instruments for the rhythm section before Elvis would arrive. The band was in at around 21:00 hours, would get the sound ready and Elvis would then arrive around midnight. He would stand next to the kitchen in the Jungle Room and got ready to perform after one rehearsal. Even though the songs were dark, he was in a good mood and would joke around. Every session would start off with the piano and everybody singing gospel as a warm up and then the recording began and work continued to the wee hours. A tv-camera was installed in the RCA truck parked outside the mansion so they could observe what was going on in the Jungle Room. Just imagine being the sound engineer in the truck and listening to Elvis in the raw. How magical that must have been. Elvis would just be accompanied by only by a rhythm section being his usual musicians such as James Burton, Jerry Scheff, Ronnie Tutt, Norbert Putnam, David Briggs and others. After the sessions, producer Felton Jarvis would take recordings back to Nashville to add strings and background vocals. Afterwards Elvis received so-called “recording references” which were vinyl pressings of each song (two songs on each vinyl) he could then have a listen and give his approval if he liked the result. They say that Elvis loved the Jungle Room so much as a studio that they thought he would keep it that way, but he didn’t and brought back the furniture. After you have explored the Jungle Room, head into the wonderful backyard. You will be exposed to lovely view of the mansion from the other side and the garden area. In the backyard you will find the Smokehouse which was built long before Elvis bought Graceland. It most likely used to be a pump house which his dad Vernon would use as a smokehouse for meat. Elvis turned it into a firing range for a short period. Other than that it was a storage room for the family. Elvis took up racquetball in the early 1970s and decide to have his own court built as he enjoyed the game so much. It’s a personal sports complex. On the ground floor there’s a two level lounge with a weight training area where Elvis and his mates could work out and play pinball. 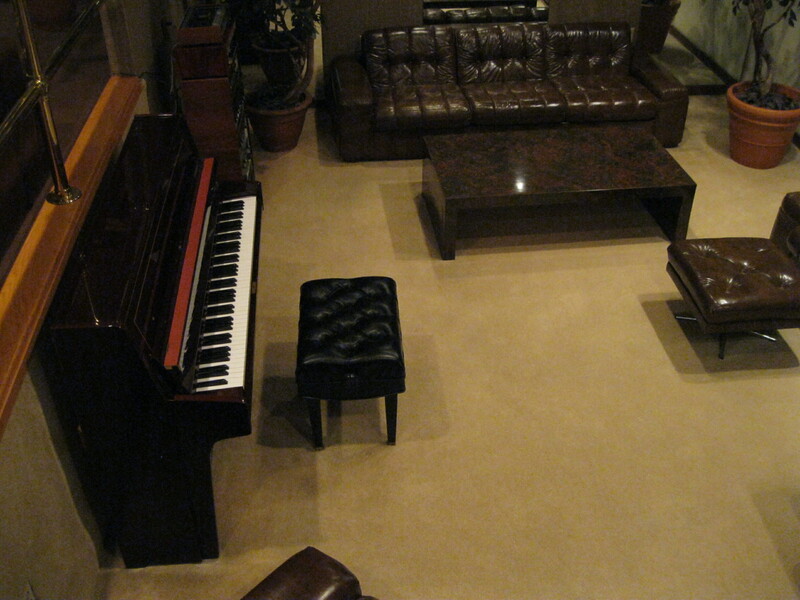 In the lounge area you will see a piano. Elvis played on this piano just before heading off to bed on the night he passed away. It is said that the last two songs he played and sang were “Unchained Melody” and “Blue Eyes Crying in the Rain”. A racquetball court, a Jacuzzi and dressing rooms are located upstairs. This is not accessible on the public tour. 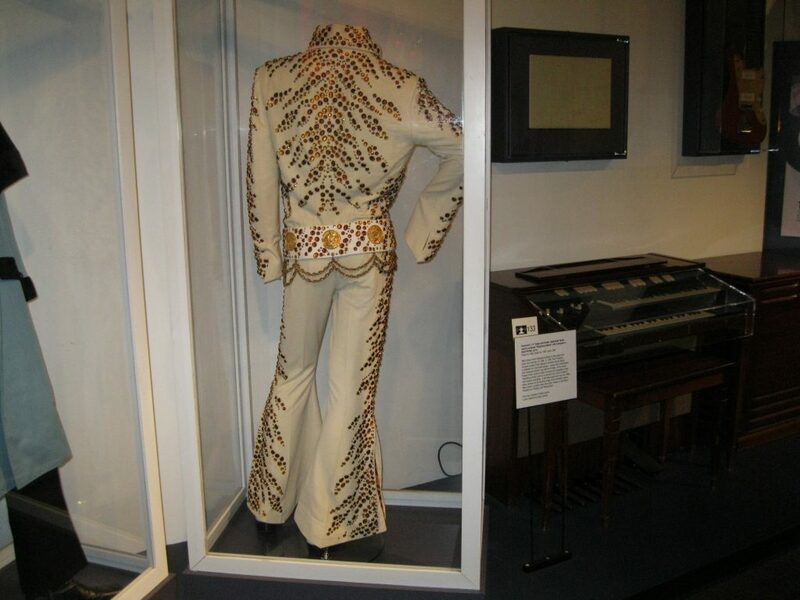 As you continue through the lounge area you will be taken to second part of the ground floor area which is the Trophy Room, only displaying Elvis’ posthumous awards and a collection of his many jumpsuits including the legendary outfit he wore on the classic recording “Aloha From Hawaii Via Satellite” from 1973. The other suits are regularly rotated. The construction of the building was personally supervised by Elvis and was completed in 1975. In the 1960s another building was added to the property. This would be known as the Trophy Building, connected to the music room in the south part of the house, and leads outdoors to the swimming pool and the patio installed in 1957. The building contains all sorts of trophies Elvis obtained during his lifetime and many different costumes as well. Exploring this building is so fascinating as it is a testament to Elvis’ magnificent and versatile career. You will be amazed with the amount of gold and platinum records, Grammies, equipment and awesome outfits. The final stop on the tour will very appropriately be at the Meditation Garden as this is where Elvis has been laid to rest next to his parents Gladys and Vernon, his twin brother Jesse and his grandmother Minnie Mae. The graves are based behind the end wall of the mansion with a fountain as the backdrop. Elvis’ grave is surrounded with miniature statues, flowers and a Stars and Stripes on each corner and is based beneath a bronze plague with an eternal flame at the head of the grave. The whole setting is very tastefully done. Elvis was initially buried at Forest Hill Cemetery in Memphis by after security issues he was moved to Meditation Garden in October 1977. 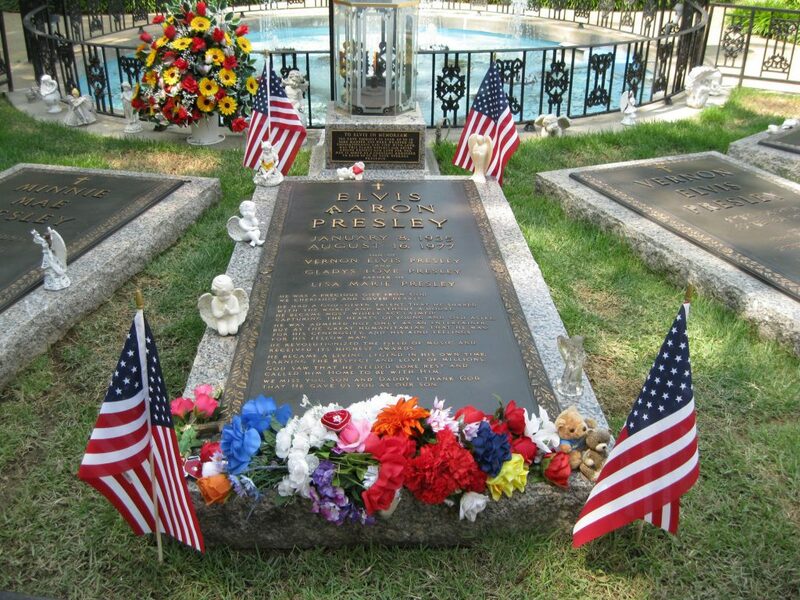 While Paul McCartney was in Memphis in connection with his “Out There” tour in 2013 he visited Graceland for the first time, paid his respects and placed a personalised guitar pick on Elvis’ grave “so Elvis can play in Heaven” as McCartney said. Paul McCartney and The Beatles met Elvis as a group for the first and only time on 27 August 1965, but this was at Elvis’ Bel Air mansion in Los Angeles. As you have passed through the Meditation Garden you will arrive at the driveway entrance on the mansion from the other side. The tours is finished and you can return with the shuttle bus to Elvis Presley’s Memphis across the road. After you have returned on the shuttle bus from Graceland back to the loading/unloading area across Elvis Presley Boulevard. 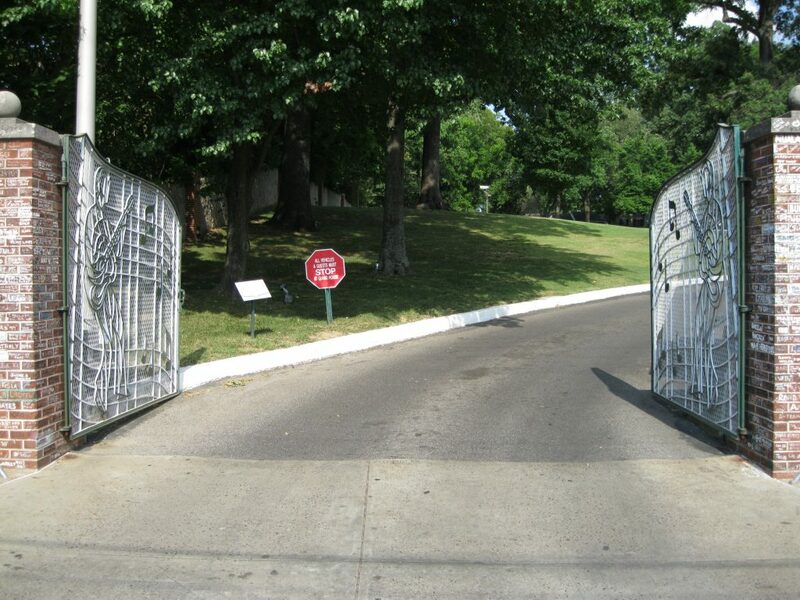 Walk back and cross the street to check out the gates of Graceland. Be careful as the traffic can be heavy. 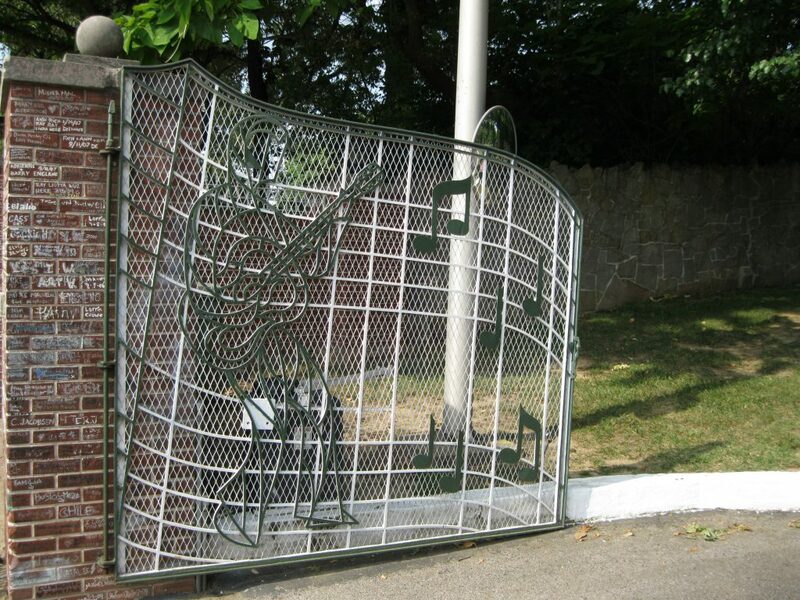 The gates themselves are beautiful with marvellous silhouette designs of Elvis on each gate. These gates were installed in April 1957. 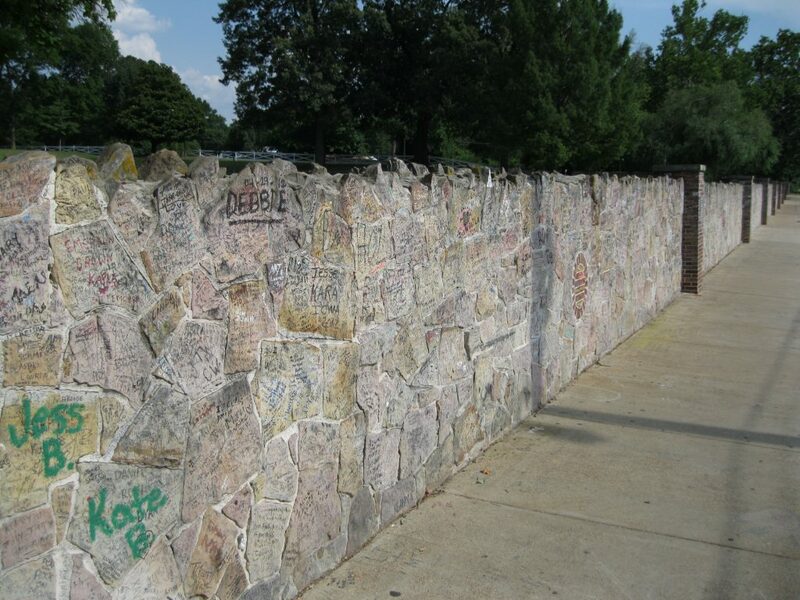 Go exploring down along the walls of Graceland as well and you will see tags all the way down from countless of fans as a tribute to Elvis. Just opposite the Graceland Mansion on the other side of Elvis Presley Boulevard, Elvis’ two private jets are on display. The Lisa Marie, named after his daughter, and the Hound Dog II. Both with the TCB logo on the tail. Elvis called the Lisa Marie his flying Graceland and it was used from November 1975 to August 1977. It was a 1958 Convair 880 jet that he bought in April 1975 for 250,000 USD and remodelled for more than 800,000 USD. The Lisa Marie was also known as Hound Dog I. 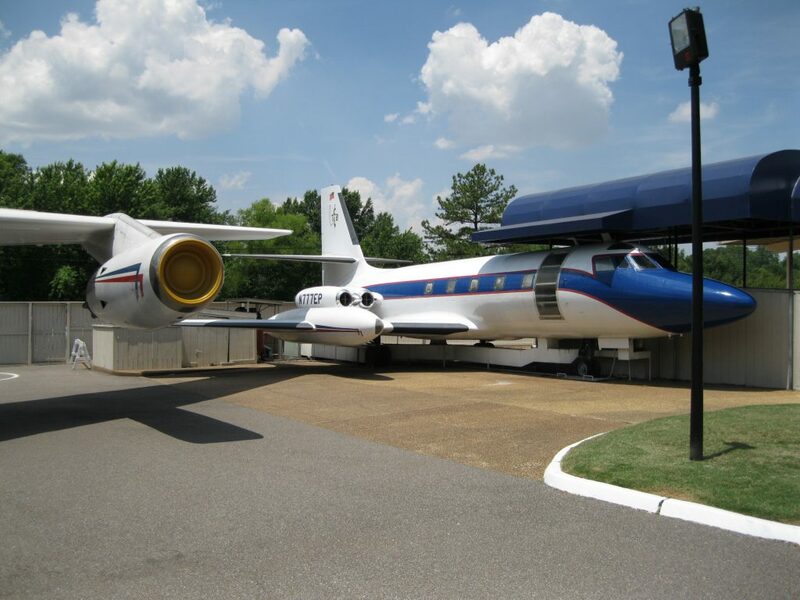 Over the years Elvis bought five planes but only two are at Graceland and open for tours. Exploring this customised jet is an absolute delight, going through a living room, conference room, sitting room, private bedroom and more. The plane is equipped with luxurious details such as gold-plated seat belts, suede chairs, leather covered tables and gold-flecked sinks. Elvis’ first flight on the Lisa Marie was on 27 November 1975 when he travelled to Las Vegas for a two-week concert run. The Hound Dog II is a 1960 Lockheed Jet Star which is a smaller plane customised with yellow and green interior mainly used to transport Elvis’ manager and his staff between cities during tours. 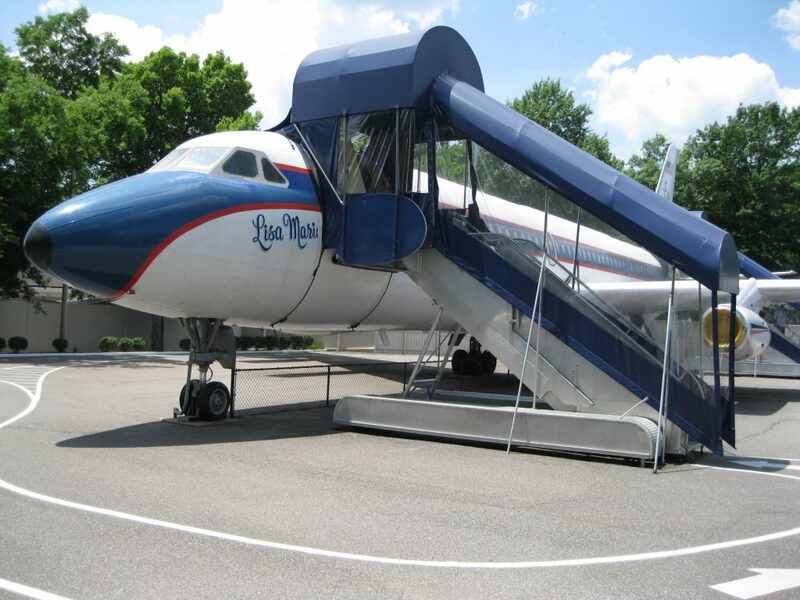 Located behind Elvis’ Airplanes you will find the big complex known at Elvis Presley’s Memphis an abundance of attractions and exhibits related to Graceland and Elvis. If you are feeling a bit peckish there a several options to find some grub. If you are into Elvis souvenirs and merchandise there are plenty of options for getting some wicked t-shirts, fridge magnets, caps and so on. Anything you can imagine. A true Mecca for a dedicated Elvis fan. On this side of Elvis Presley Boulevard, several of remarkable exhibits are based. There are several fabulous exhibits such as the Elvis Presley Automobile Museum. Have a stroll through the complex and you will find something that takes your fancy. 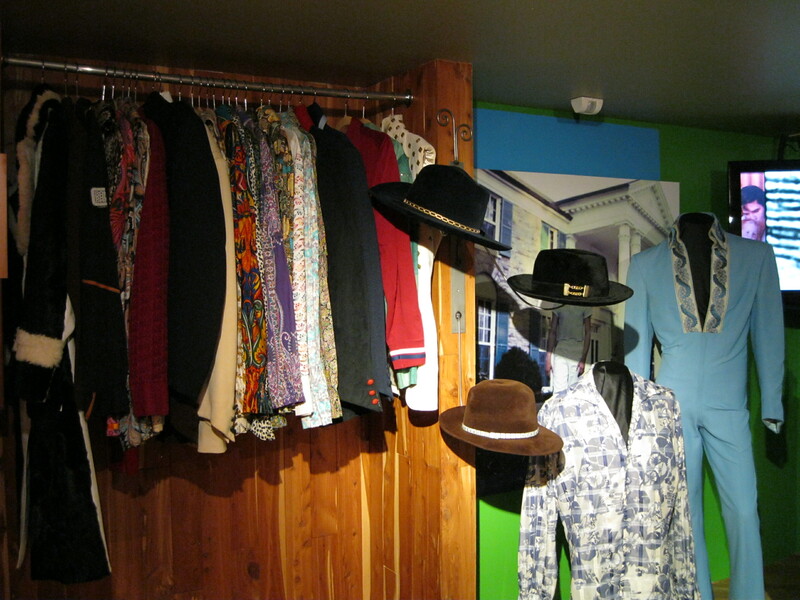 There are exhibits with displays of outfits of major artist who have been influenced by Elvis along with their unique take on The King. On video screens you can flow interviews with other major artists and her their view on Elvis as well. This is so delightful and great to hear their appreciation of Elvis and his music. The exhibits may change from time to time to make it interesting for visitors who return to Graceland. If you are into vintage cars you will be stoked about the Elvis Presley Automobile museum. There are about 30 cars in the total collection but Elvis purchased more than 200 vehicles, but he gave most of them away. It was a status symbol for him and in his younger days a sign that he made it. One of the highlights on display is Elvis’ first Rolls Royce which is a black custom made 1960 model. An interesting fact is that Elvis did drive all his cars himself, he didn’t have a chauffeur like many other big celebrities. 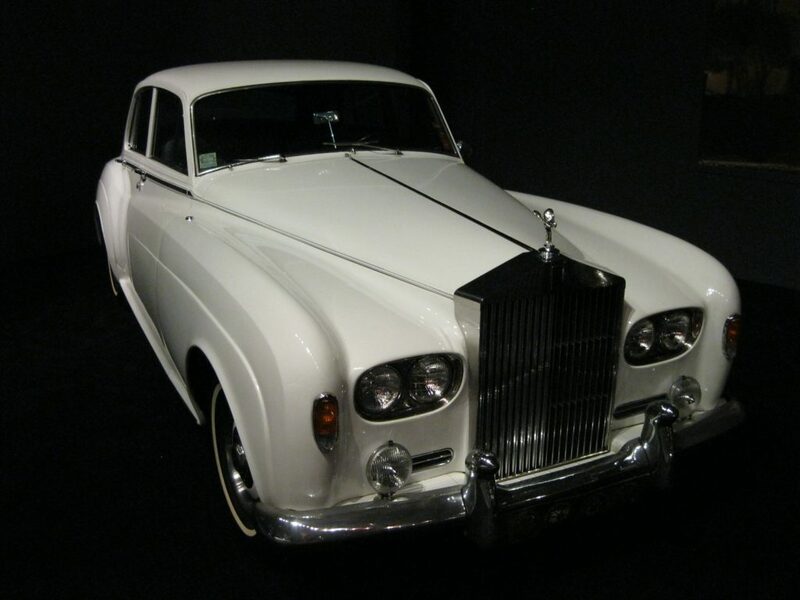 Elvis’ white Rolls Royce is also on display. Such elegant vehicles. 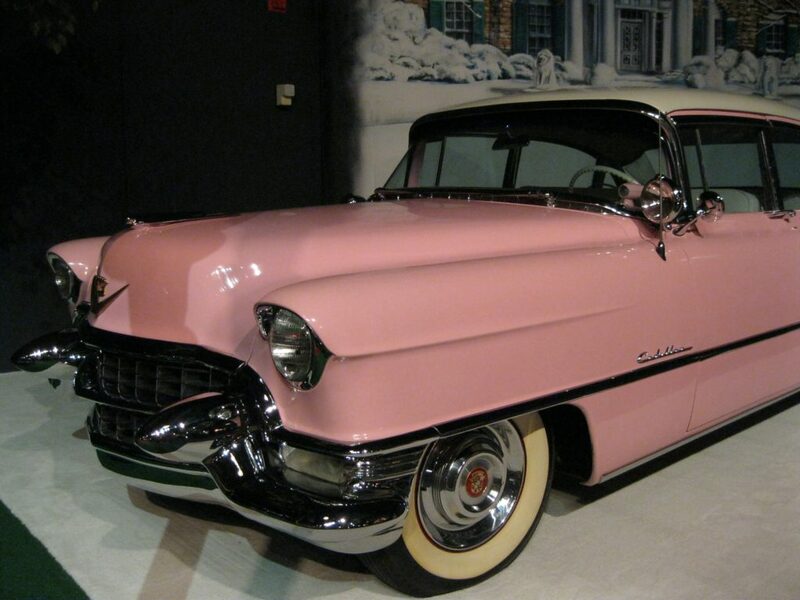 The most famous car on display is Elvis’ Pink Cadillac. It’s a 1955 Cadillac Fleetwood. The original colour was blue but Elvis had it custom painted pink. Surprisingly it was used for touring. He would get around with his musicians and strapped equipment to the foot and the top of the car. A fun fact about a detail of the car, when facing the front of the car, you may notice the gadget to the right of the steering wheel. This is what is known as a dimmer switch which detects lights coming on towards you and will dim the lights of the car. You wonder why we don’t have that in our cars today. On 2 September 1955 while touring, lead guitarist Scotty Moore was driving the Pink Cadillac and hit another vehicle in Texarkana. While it was being repaired, Elvis bought another car for touring. When the Pink Cadillac came back from the shop, he gave it to his mother who didn’t have a driver license and couldn’t drive. 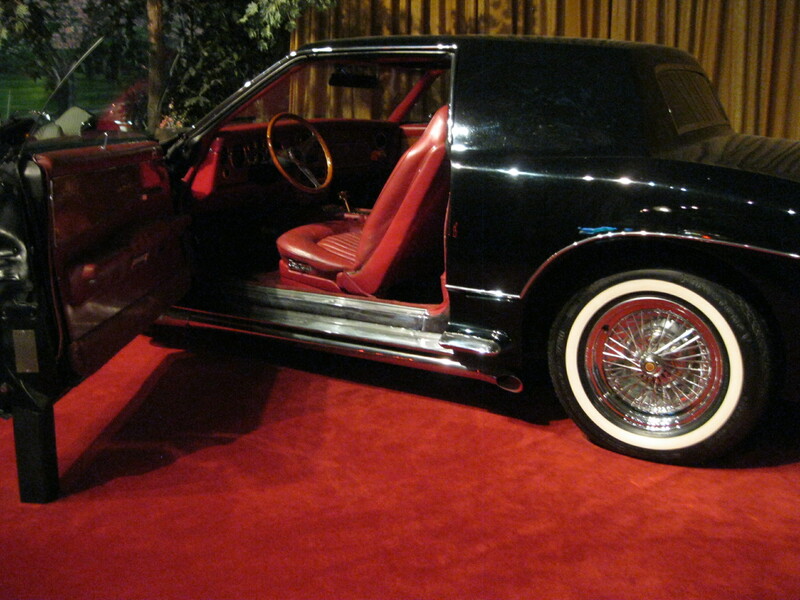 Another amazing car at the exhibit is the black 1973 Stutz Blackhawk bought by Elvis in September 1974. It was customised with red leather interior as opposed to black with gold trim on the dashboard. It is thought to be one of Elvis’ favourite cars and was the last car he drove before his passing. Elvis owned several Stutz cars and the first one he bought was ordered by Frank Sinatra but Elvis showed up at the dealership the same day the car arrived and managed to convince them to sell him the car instead. You wonder what Sinatra thought of that. Other fascinating cars are the 1975 Ferrari Dino used for speed to the 1969 Mercedes Pullman Limousine with six doors. The latter is one of the few cars that Elvis wouldn’t drive himself as he had a company who handled it for him. It was bought in Hollywood and used there as well. It is actually also flown into Virginia and used on all the scenes on documentary “Elvis On Tour” from 1972. The Purple Cadillac is yet another favourite among visitors. Elvis bought the car in Texas and the original colour was white. He had it custom painted purple and added some chrome to it as well. Elvis’ cars all had a certain lifespan so he would eventually sell or give it away. This car was found years later in a junkyard in Alabama. The family who found it just wanted to restore an old Cadillac but they found out via vin number research that it had been Elvis’ car. This was in the mid-70s. They wanted to bring the car back to Graceland when Elvis passed away, so they looked at photos and restored it. It was a part of the family for years and when the Elvis Presley Automobile Museum opened they decided to put it on permanent loan. It’s been in the museum since the 90s.